Thank you for your comment, unfortunately for #2's progress documenting and taking screen shots has slowed down the actual progress of the run as I usually don't have a lot of free time to play even though this is one of my favourite games right now. Hang in there for more great stories about Keg 2. And not to worry, Keg 3 actually is started but don't think that fact alone bodes terribly for Keg 2 as I wanted to try a couple of things in the early days to gauge the overall "success" of Keg 2. 1 hour 19min left on the forge fire, warmer day for sure and 83% condition. 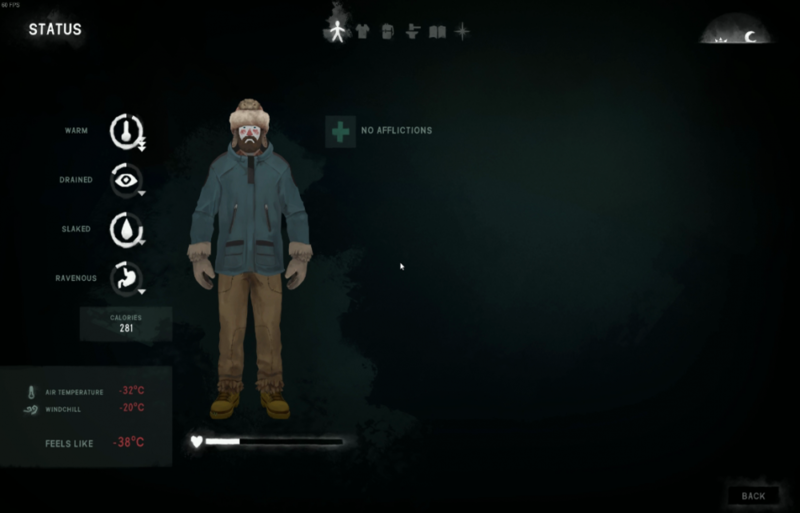 3.87 hours left and I will have pants! Another 0.5hrs completed and FLT -10C. Head out at dusk after another 0.5hr on the pants towards Poacher’s for more stick collecting. No wolves out on the ice tonight. Light the fire in the barrel and crank it up to 2hr44min and positive temp bonus. I recharge to half temp meter then go break down a scrub and then add my 1 coal for maximum warmth. Over 3 hours on the fire to collect now but once again fog rolls in and I can barely make out what’s in front of me. I’m headed towards ML along the tracks to collect off the left side where I have almost never gone before. I’m pretty sure there would still be reishi and rose hips over here if I could only stumble on them. It’s an absolute stick mecca! Too bad it is so far away from base that it takes significant effort to collect at this distance. 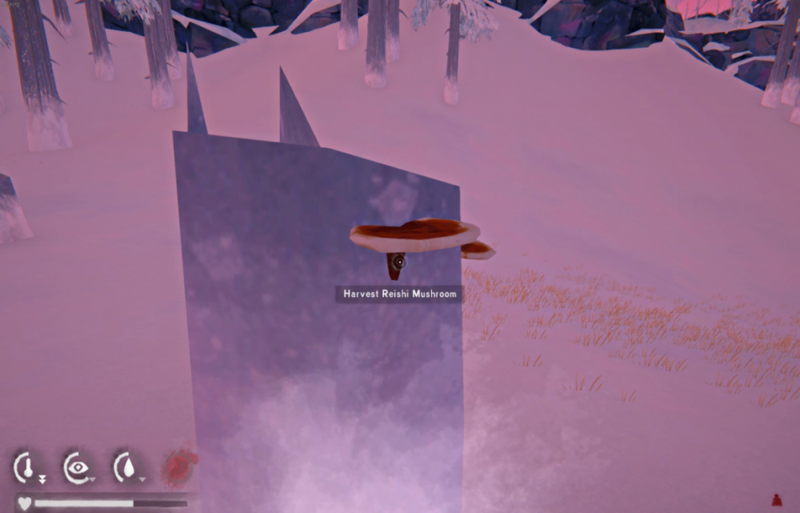 Included in my treasure are 4 more reishi, 8 rose hips, 10 cat tails and no wolf encounters. A bit of a sacrifice with health down near 50% and hypo at 29% as I head back to the burn barrel but the final tally is 50+ sticks in just over an hour. As a bonus after warming the fog has lifted up and I can see more than 200m out on a somewhat clear night with moon. 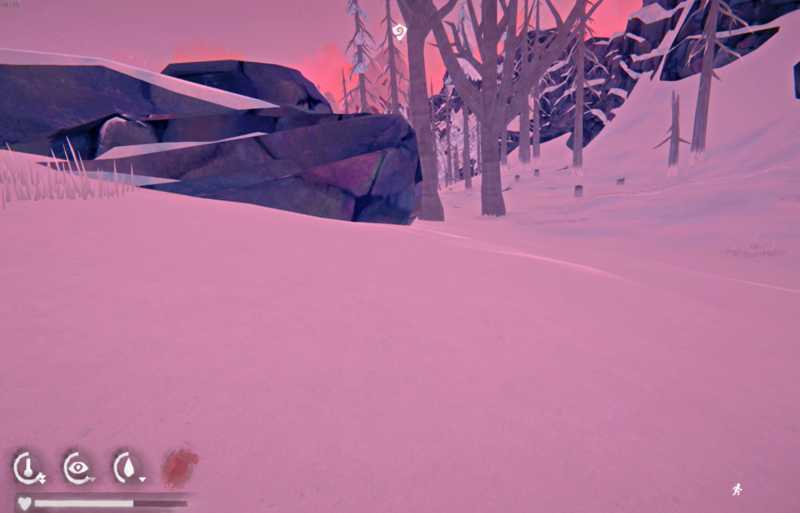 Drink a tea and go past the bear cave and wrap around to the warm cave behind the hill. 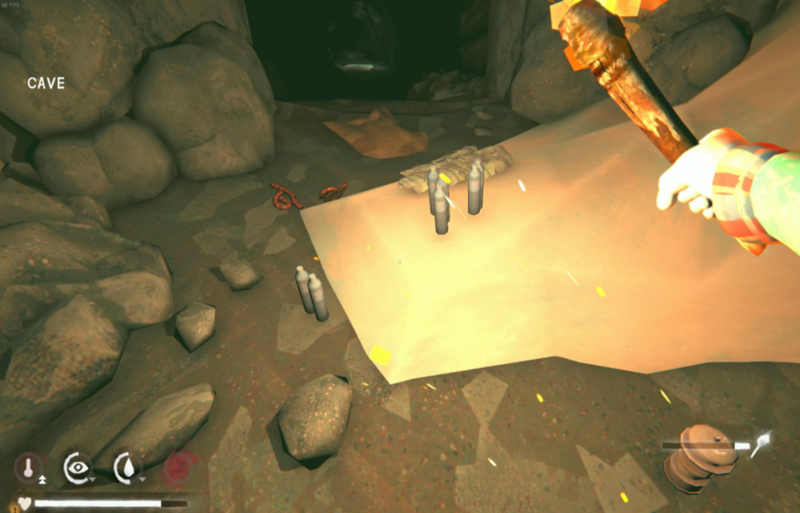 More sticks and 3 coals are found in the cave. 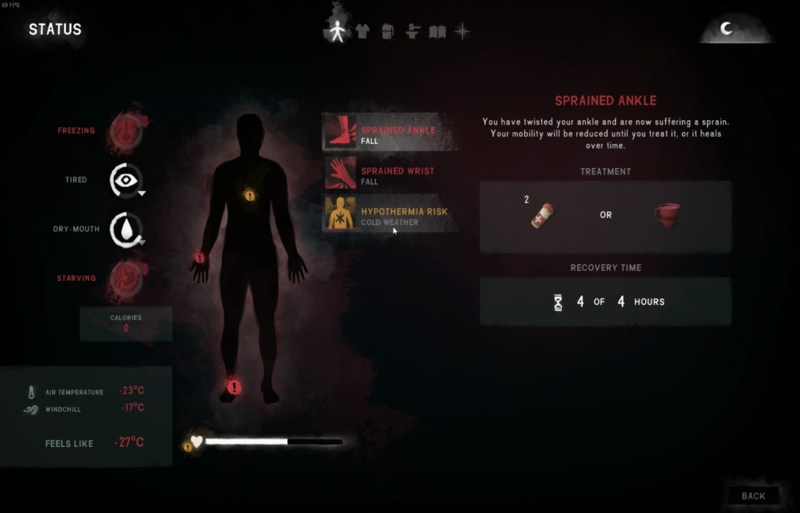 There is a wolf up near the edge of the map so I won’t be pushing my luck with that plentiful stick area plus warming-up has just ended and hypo has started and I don’t want to be taking too much more of a health hit on this trip. Warm up at the fire and pull torches down to leave, heat up one last tea and point towards bed with 72 sticks. Uneventful return, 52 sticks on the forge fire = 9hrs 2min of burn time, it’s also sun up, my schedule is being pushed further into the morning. I have been sleeping starting around 3am up till now but this has to be 6am to 7am-ish. Since I am warm I do 0.5hrs on at the crafting table on my pants. 0.5kg steak, 2 cattails and off to sleep for 10. 1 hour 19 min on the fire, 53% condition, FLT -11C outside the barn. 2.37 hours left for pants, 1 fir log on the fire and that should almost be done finally! 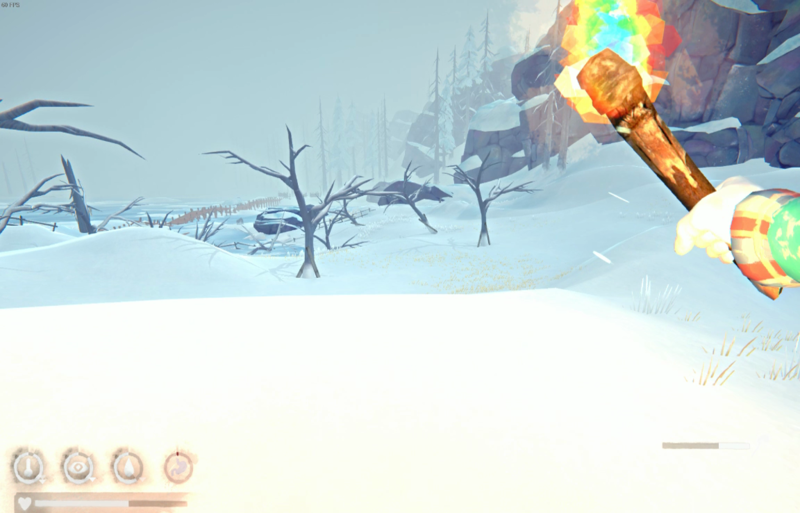 Warmth bonus up to +9C, this probably concludes the extent of crafted clothing for Keg 2. 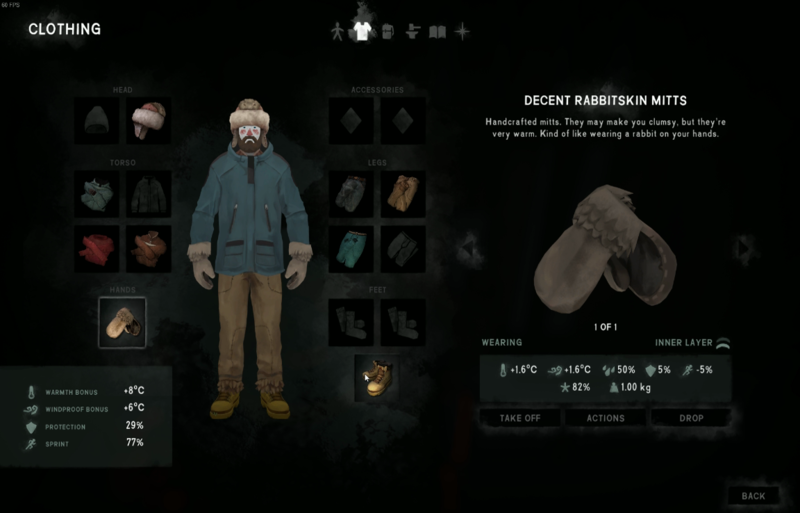 I can’t see getting enough deer hides for boots or another pair of pants. I sleep for an hour to save my session as I have been up too long IRL. Back at it another day, I wake up and come to realize that this pants mission has left me seriously depleted of fuel stores. Fuel: 1 fir wood, 17 sticks and maybe 13-15 coal on the ground. 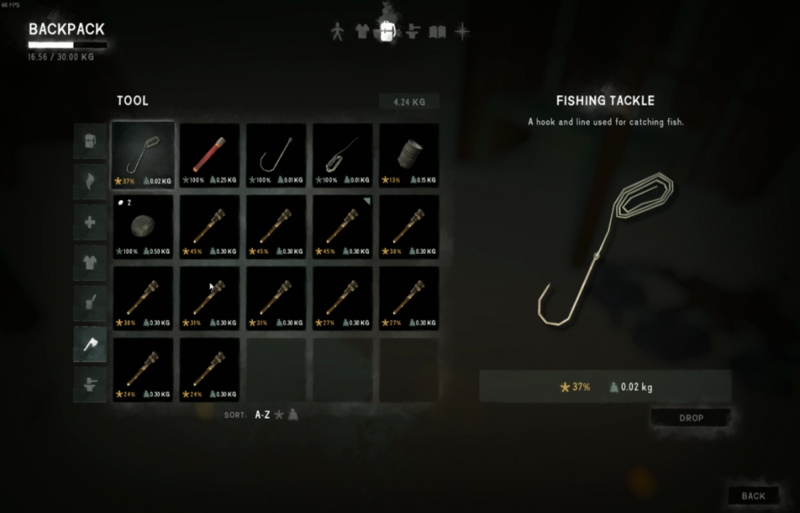 Supplies: 46 cat tails, 1 cloth, 1 gut, sardines, 6 pills, flare, 3 torches, line, 2 hooks, 1 fishing tackle, 13% can, 2 other cans, 1 stim, 4 matches, 18L water, 0.5kg steak and another 0.6kg steak on the ground towards the broken tower. Shorter day breaking down fuel near the barn. 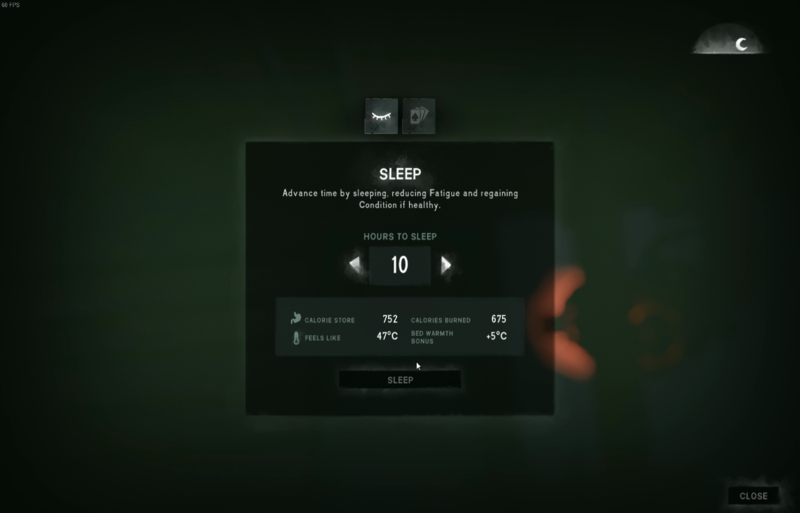 I need to reset my wakeup time, so lots of sprinting allows me to sleep around 3-4 am. I sleep for 8 hours. 65% condition, awake and absolutely perfect weather. 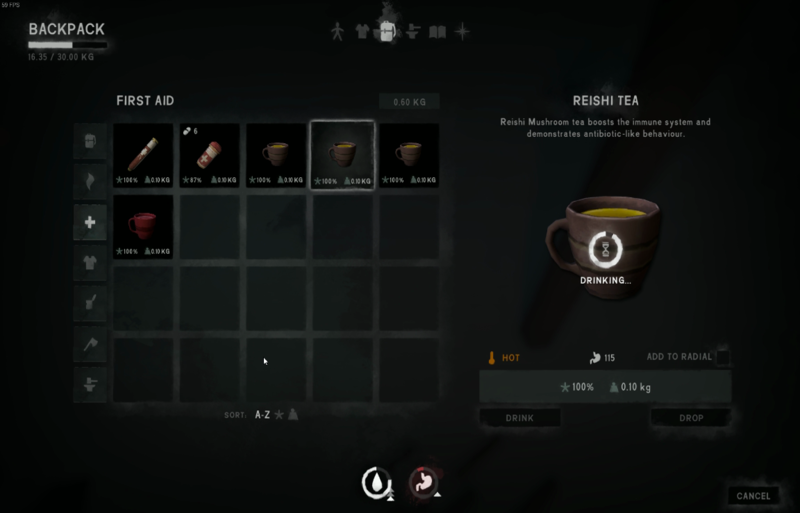 I drink a warming tea which will give me max temp for 40 min. 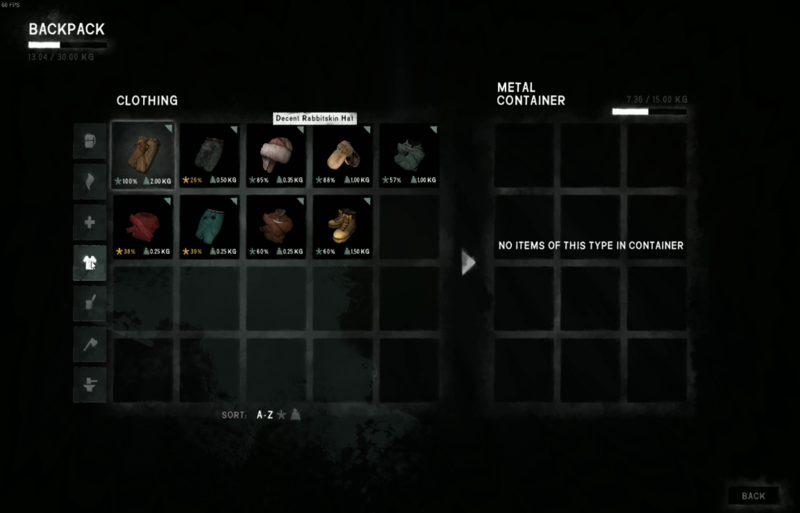 With 1 down arrow I should be good for almost 3 hours collecting. I plan to search all along the south of FM. Along the way there is my can full of boiled water - almost forgot about you. I even find some cattails still left out there! Last torch, better get a fire started soon. 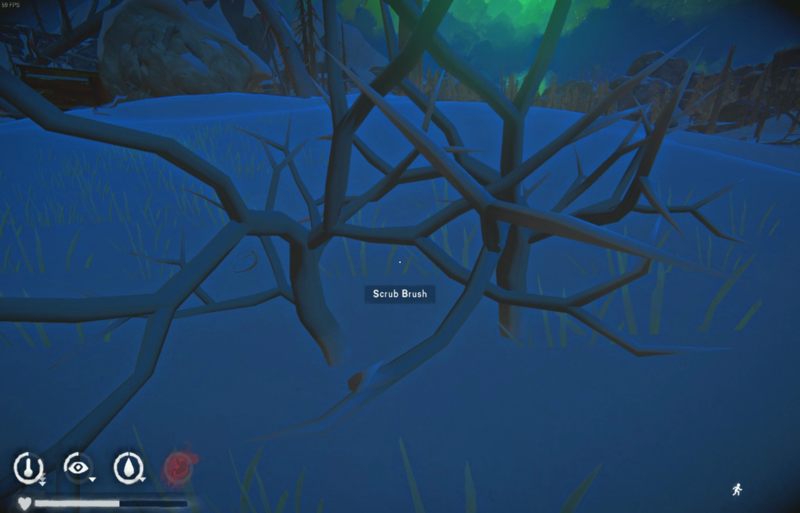 There are so many bushes and sticks I could be here for a while – I am near the far end of FM by the ML tunnel. Wow, FLT is only -4C around dusk. 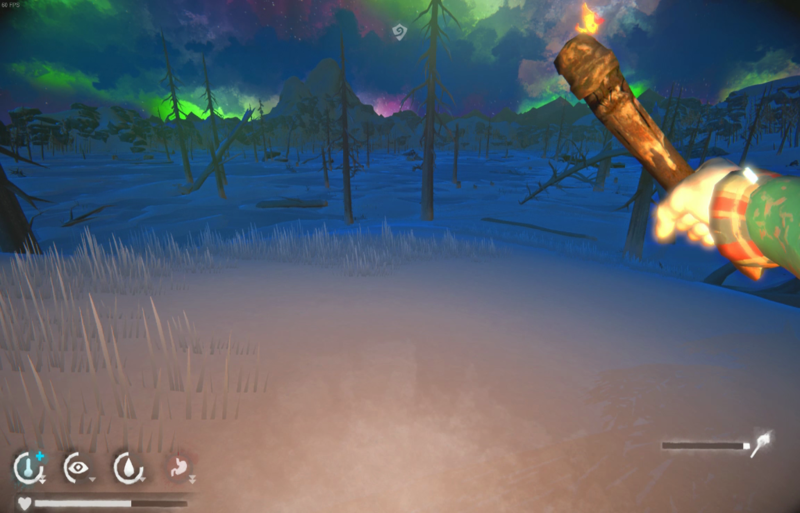 Collect over 90 sticks; take 4 torches from the warm-up fire and head towards Poachers careful to take a wide arc around an aurora bear that is glowing green. No stopping at the barrel, it is warm enough to push on. Halfway back and green wolf is interested in me. 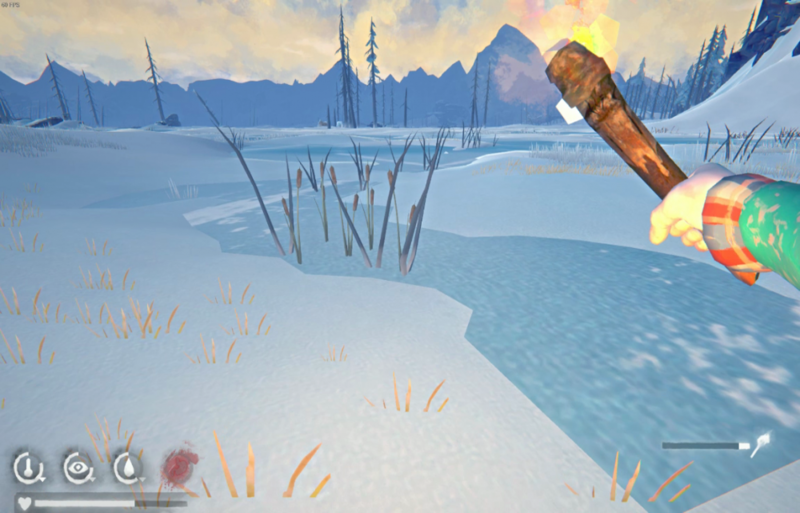 I’ve got my trusty torch fire source so I quickly drop a fire and push her back across the ice just a hypo afflicts me. 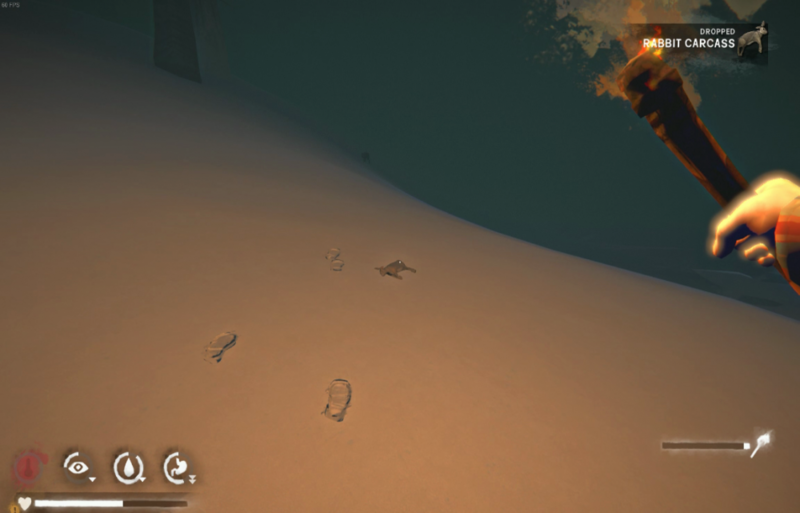 The fire worked but now #2 wolf is coming at me as I try and make a break. 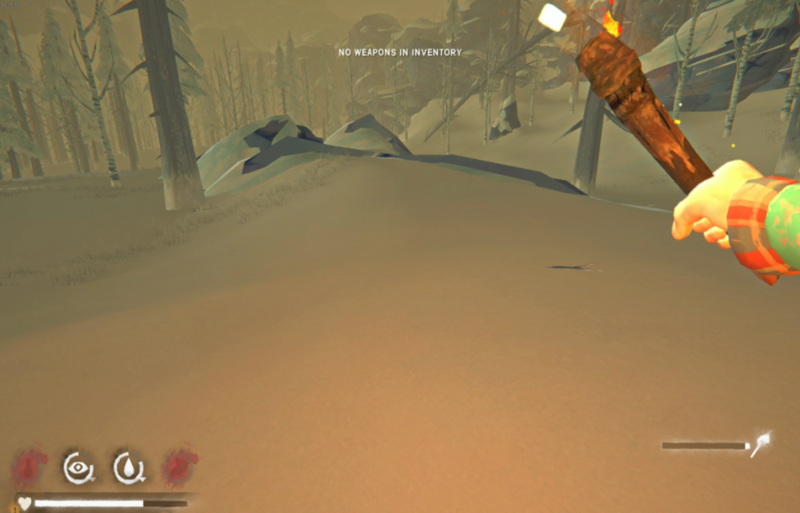 No safe ice route so I hug close to the fire and stoke it. 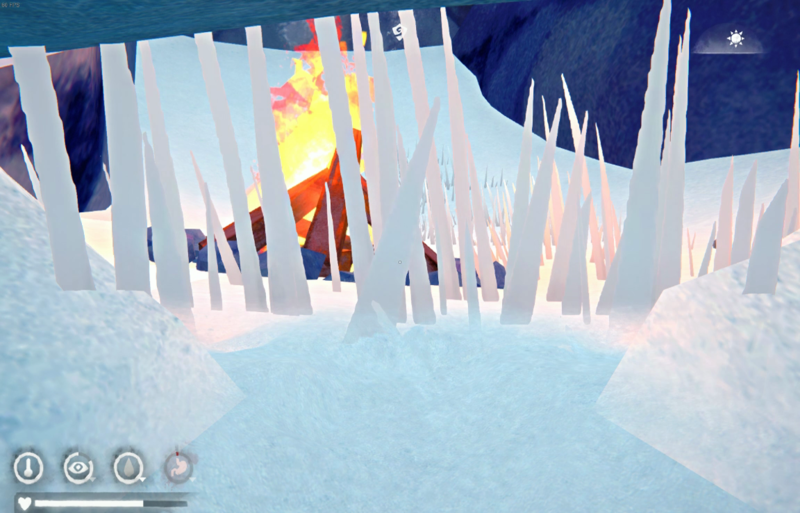 I risk a weak ice run after #2 bounces on the fire as they were directly blocking the safe path. She doesn’t give up the pursuit all the way to the dock. 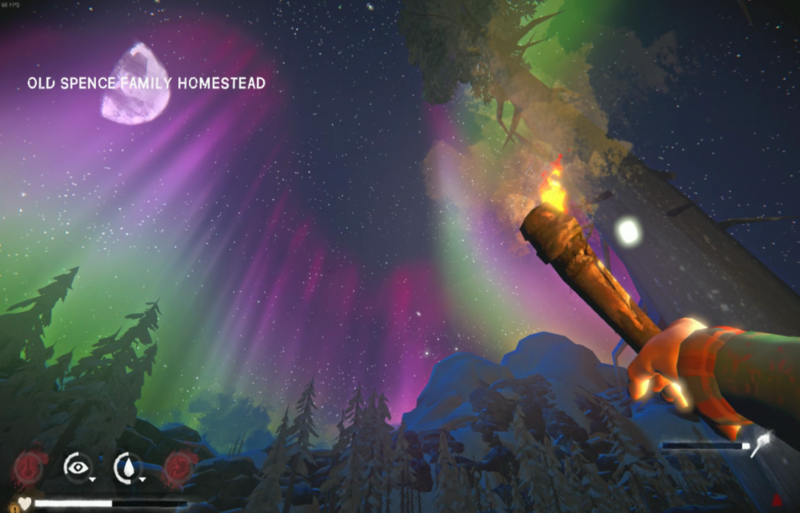 What a beautiful aurora night with moon as I crest the hill at Spence’s, this is why I love the game, absolute terror of 2 stalking aurora wolves followed by the scene before me now. 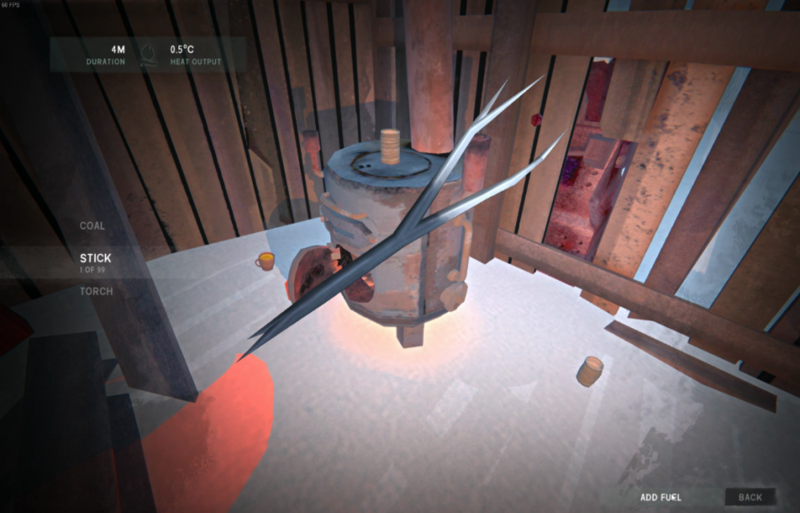 104 sticks is my final tally as I light up the forge fire for the night. 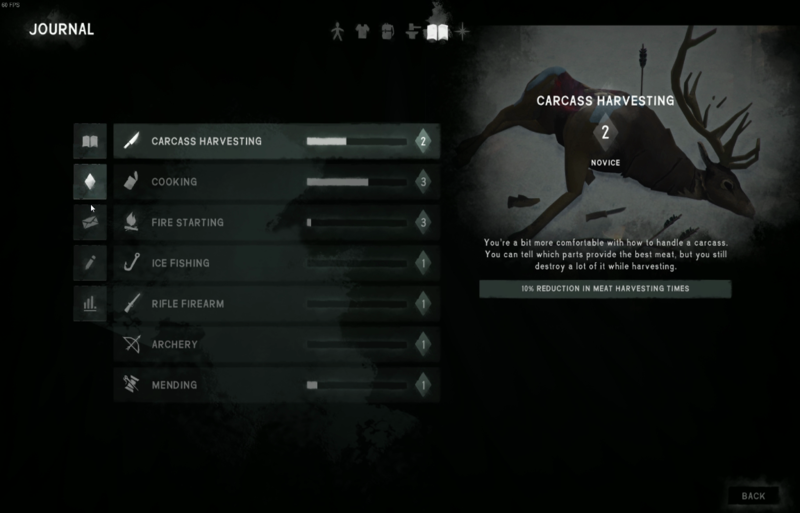 I eat one of my last two 0.5kg deer steaks and a couple cattails and settle into bed for 10 hours. Wake to over 3 hours on the fire and 80% condition. Loaded up with torches and water at camp I draw down the fire. Time for a deer hunt as I noticed one close by camp today; need a few calories to keep me going. I can hear wolves howling in the distance and I know there is almost always one by the broken tower. That’s where I am pushing the buck towards. One false start and he runs back towards the barn, I circle around a second time and get him lined up better this time. 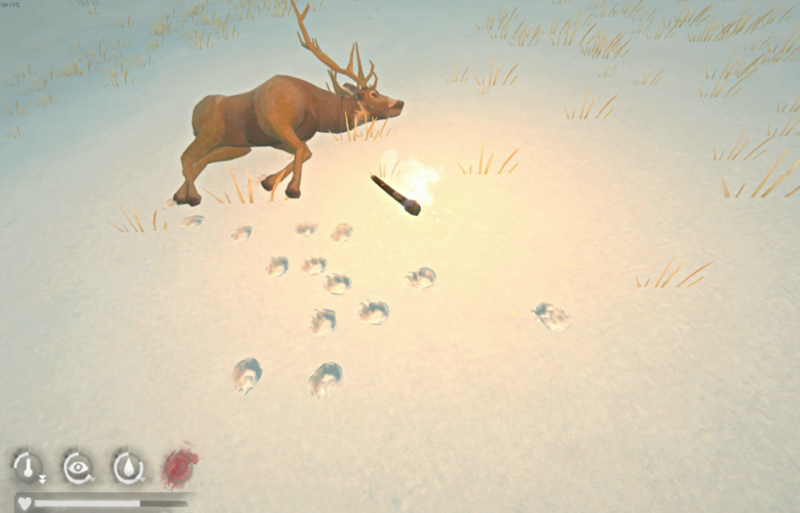 Finally I get the deer and wolf lined up and I jump up from my crouch and run towards him, pushing him in just the right direction. Looks like a for sure kill. 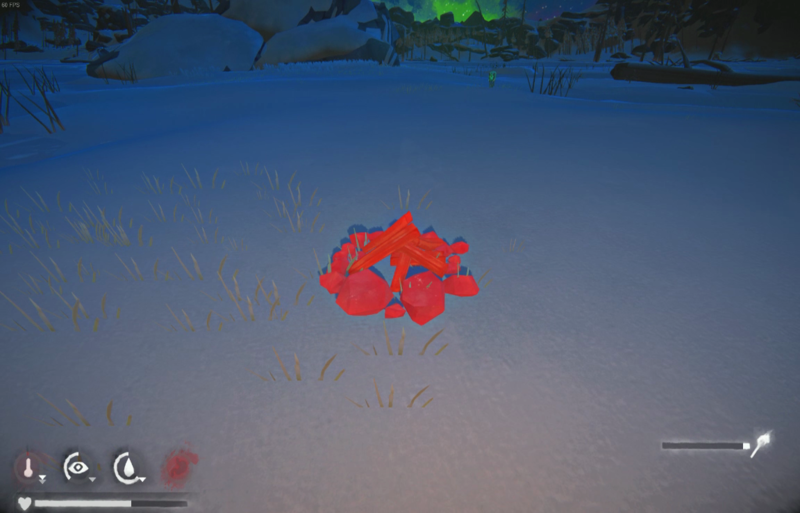 I set up a safety fire and then toss my torch and scare her away towards the cave. Second fire up and roaring and I get to work with the harvest. 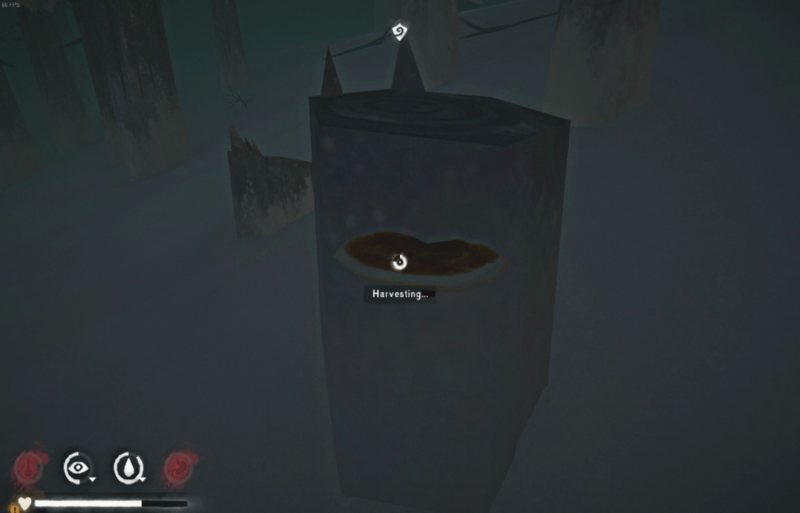 I harvest 1kg first out of 6.8kg total and put it on to cook and then take the hide and drop it in the cave. After another 0.5kg a strong wind starts up and I get a little bit worried about my unprotected fire. Alternating between breaking down nearby branches and harvesting the carcass maximizes my temp meter usage and keeps the fire going. I test a torch in the wind to see if I can make it back to Spence’s if this keeps up, seems like it’s okay. 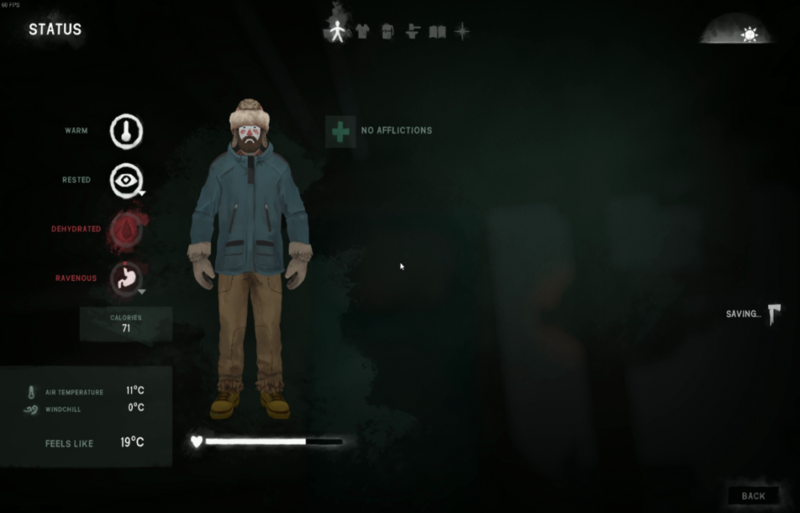 I take both guts and drop them in the cave right beside the hide. 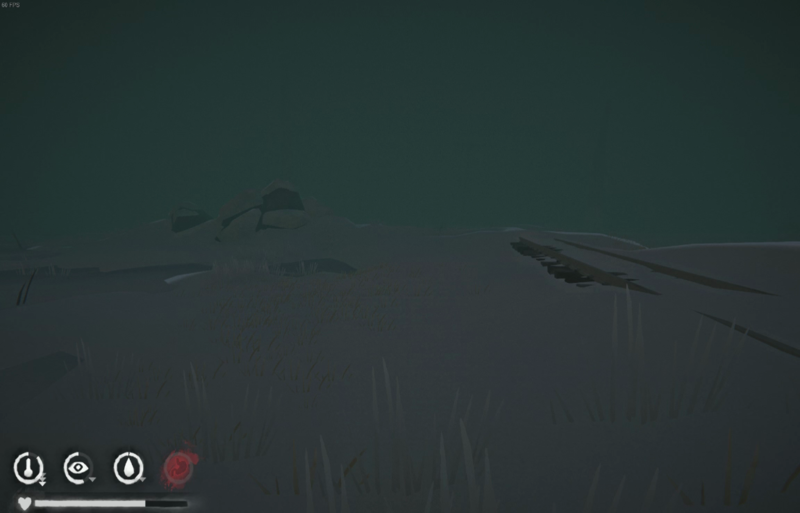 Pick up 12 0.5kg steaks, another raw bait piece and head off into the fog, wolf is somewhere out there. 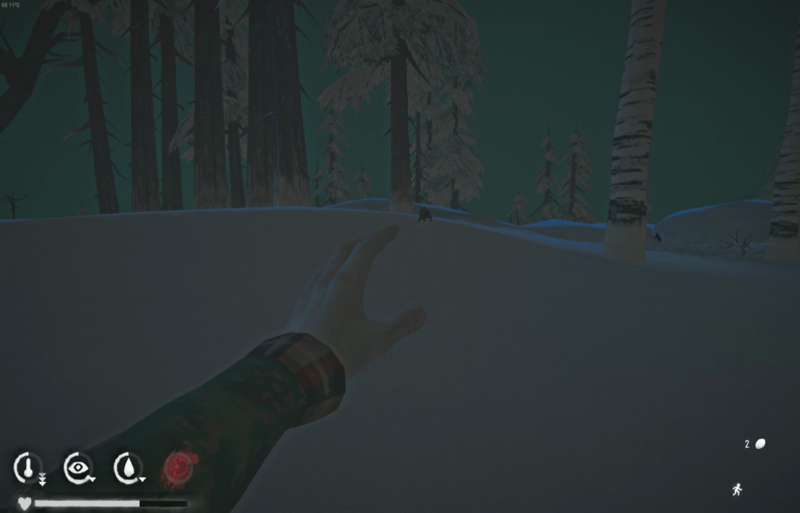 A growl and I set my bait down and back away. As soon as she takes it I will make my break. Safe back at the forge I am pretty tired from a long cooking day. I eat 0.5kg and fill the fire up to 9 hours, polish off 2 cat tails and hit the sack. I wake up to the roar of a blizzard just outside the relative safety of the barn. 95% condition and feeling good about supplies at the moment. 3 hours 32 min left on the fire. FLT is -32C outside. Nothing to do in this weather except organize my floor. Those water bottles are all over the place, stack and make rows to pass the time. The blizzard finally lets up and is “only” -15C out, almost dusk. 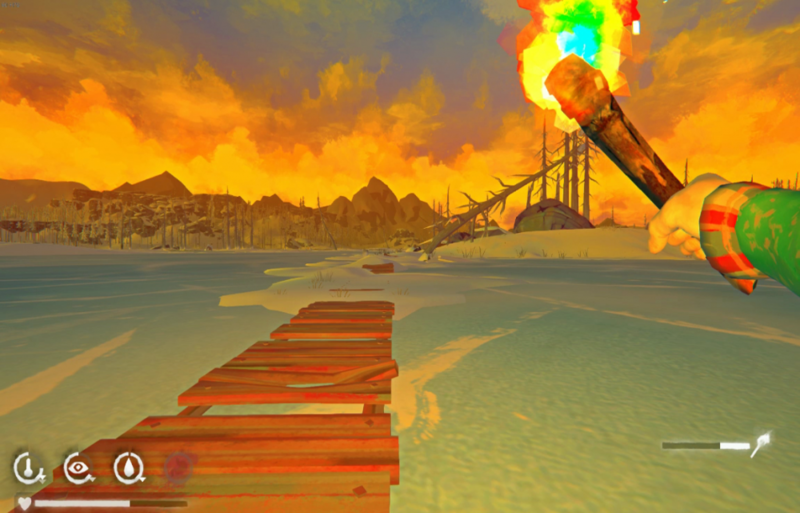 Time for a trek over past bear island, I take a good stockpile of torches and head out. Lucrative stick collecting over by the low blind, I drop a stash on the ground and continue on closer to the bottom of the ledge below Marsh Ridge. 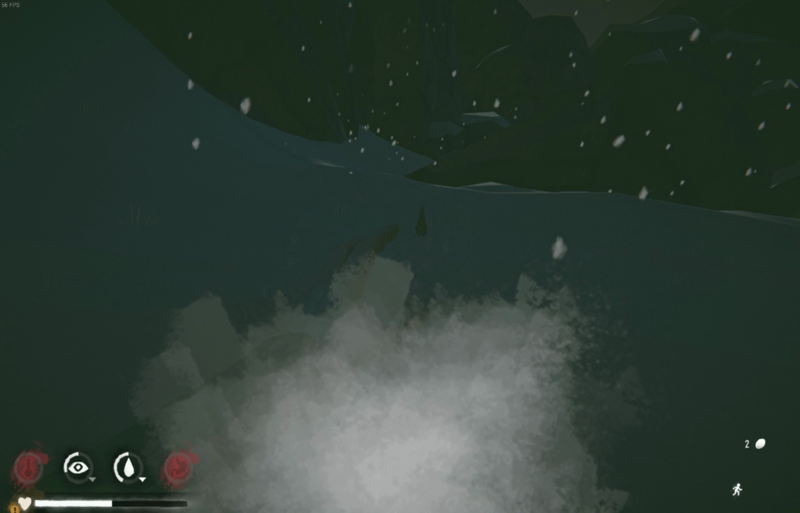 The is a wolf patrolling the ice towards Hat Creek so I detour back and mountain goat up the cliff and set a warming fire up in the ridge cave. I tour the cave almost to the creek side and back, a couple sticks but the real find was 8 coals! So exciting to stockpile an entire nights fuel in 20 minutes. A hide and 2 guts are waiting my the cave mouth and they go in my backpack for the trip home. 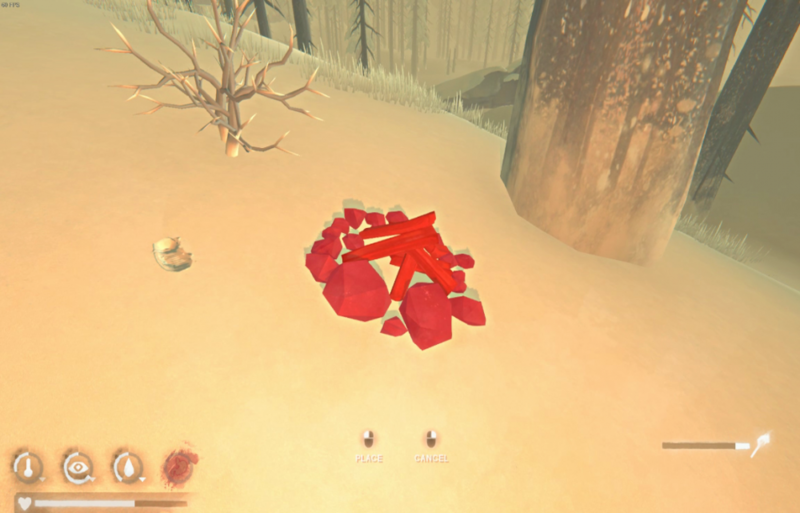 Still have some more energy so I set a warming fire at the bottom of the cliff by 3 branches and a bush. 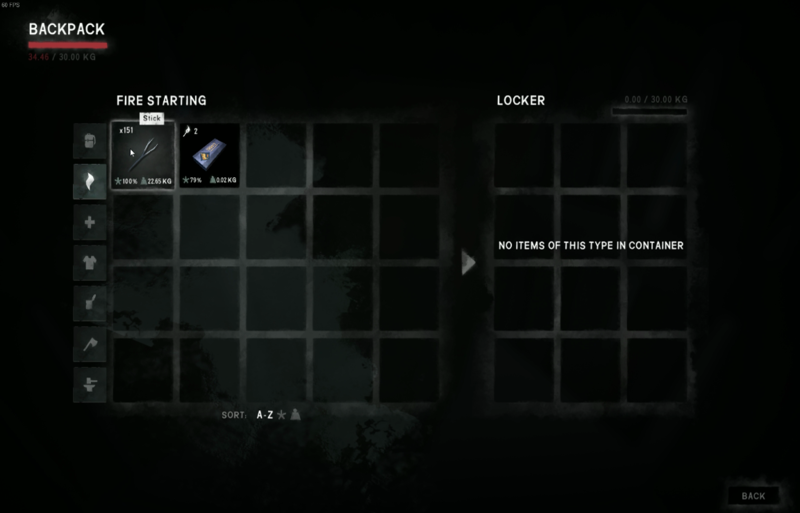 I’m a little nervous because I am right in the middle of wolf alley but high risk/high rewards are possible here with all the available fuel. I catch a glimpse of a deer off by the ice so maybe it is safe tonight. 105 sticks and 7 coal left have me overburdened, and this is not even counting my dropped stash by the blind. It’s a slow walk back once I pick up the stash however it is quiet and uneventful. It’s cost me some condition in the cold but 145 sticks will take care of that in a hurry. 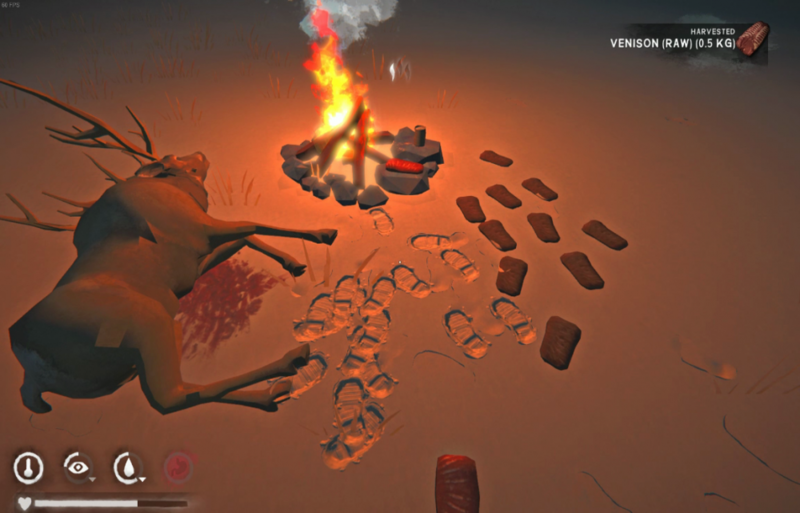 Load the forge fire up for 9 hours (64 sticks used) and the steak dinners are waiting for me – 10 more days worth if I can make it that long. 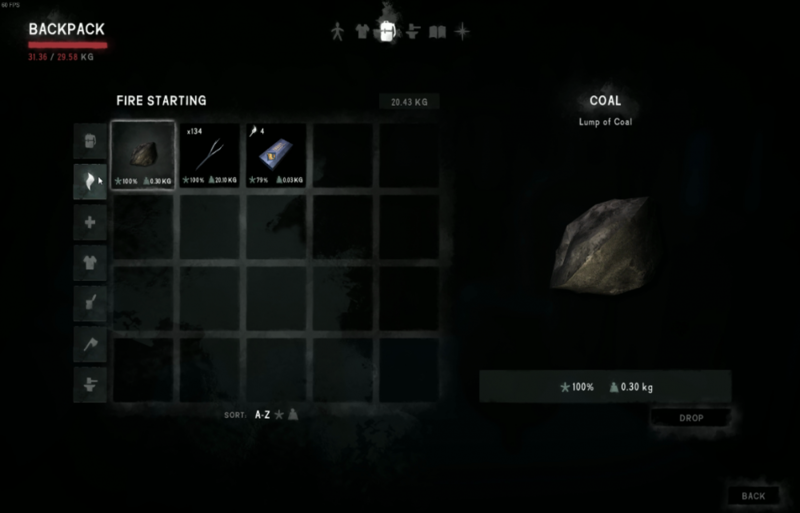 7 more coal to the pile and I have 24 total, I’ve become a hoarder. Wake to a beautiful afternoon, clear and sunny 3pm or so and 90% condition and FLT -10C. Somewhat leisurely collect sticks around the homestead for the afternoon. Pull some torches and head off towards Poachers tonight as I can’t rest on yesterdays success – this fire must always be fed. 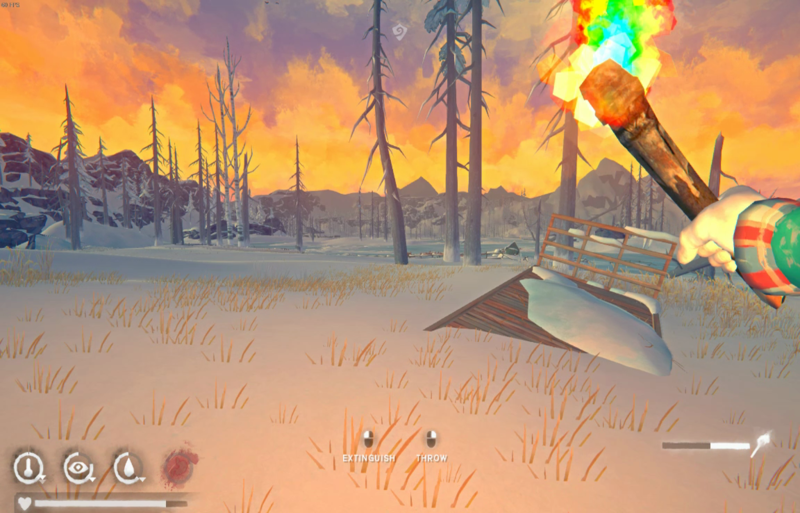 Aurora starts and night falls and the temperatures dip quickly down as well after I get the barrel fire lit and stoked up. I find some rosehip bushes by the bear cave but I don’t want to get any closer to green angry bear. 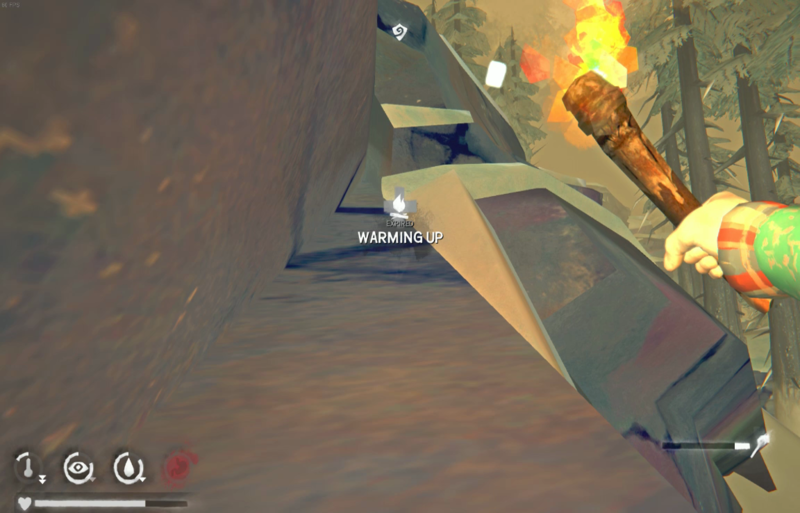 I warm up at the fire and then take the other side of the hill to get to the warmup cave. 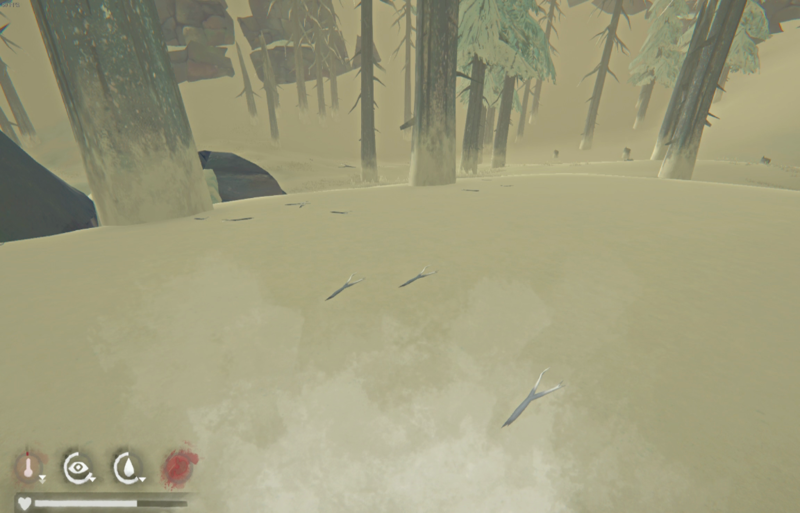 Sticks are everywhere, it’s almost like the wind is blowing them off the trees as fast as I can pick them up. Couple more scrubs and warm-ups. Wind has picked up a bit so I leave a few extra minutes on the fire in case my torch blows out and I have to run back. Returns from tonight is 66 sticks plus all the time spent in the train car. Overall it’s probably about net evens or maybe a little bit to the positive. Wake up 72% condition, what to do today? 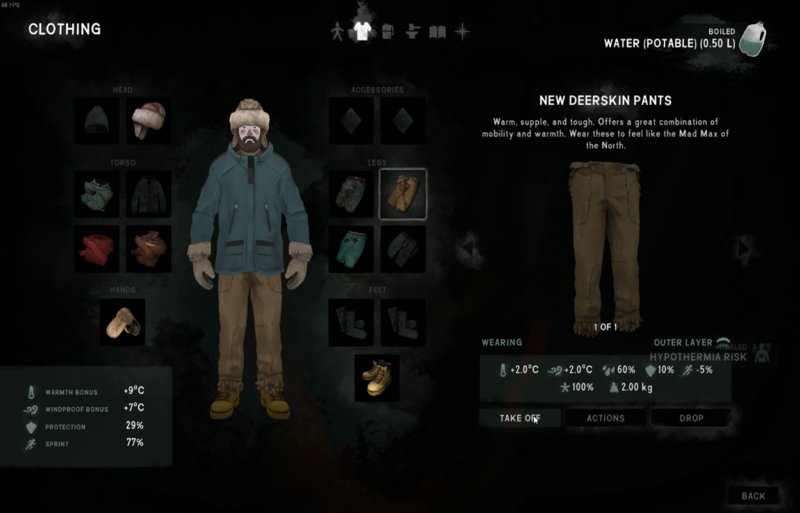 Jeans down to 20% and thermal down to 17%, won’t be much longer on these 2 items. Boots still holding pretty well at 55%. 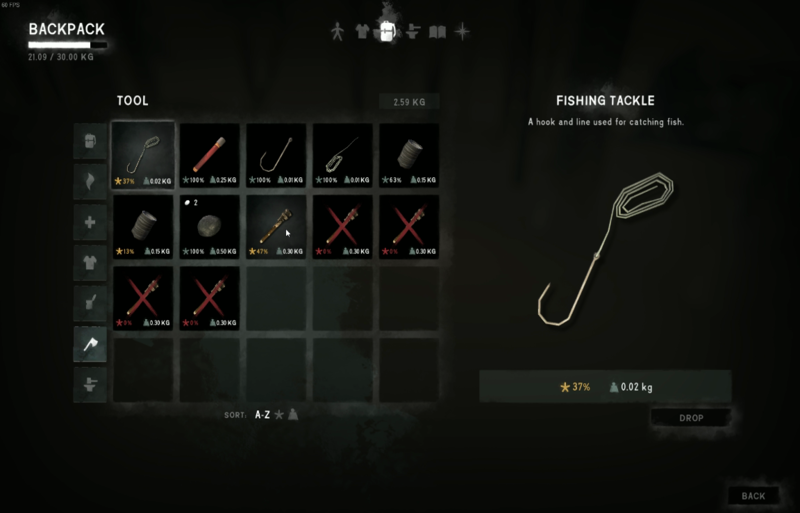 I dream of deer skin boots but the killer will be the 20 hours crafting with fishing tackle because no more sewing kit. Wind is roaring today so start out staying close by the fire collecting. Wind finally dies down and take a tea for warm up bonus and head in the direction of the bunkhouses. Cold by the first cave so start a fire and warm up. 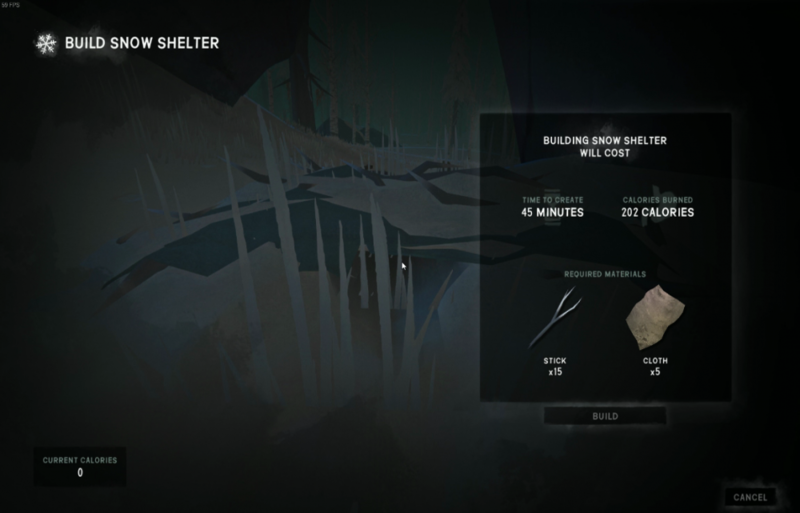 2nd cave for another warm up and then on to Muskeg Overlook. 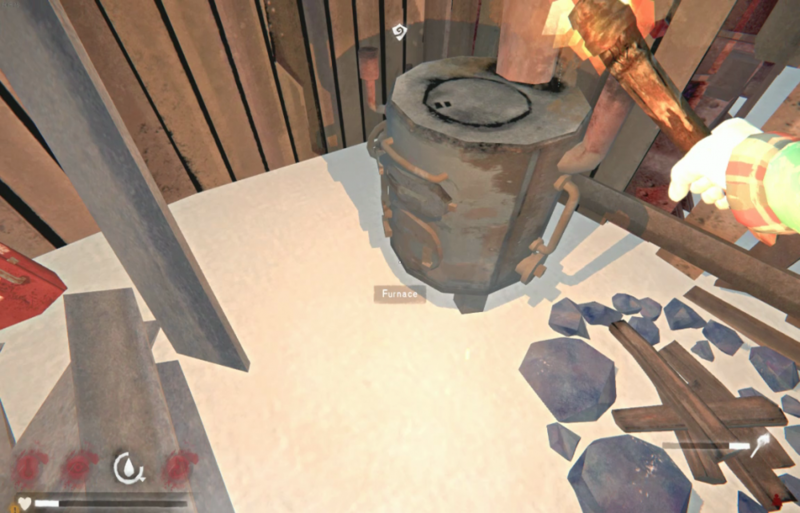 Start fire and wait 30 min and add a coal for a 4 hour fire to do faster warm-ups while collecting. 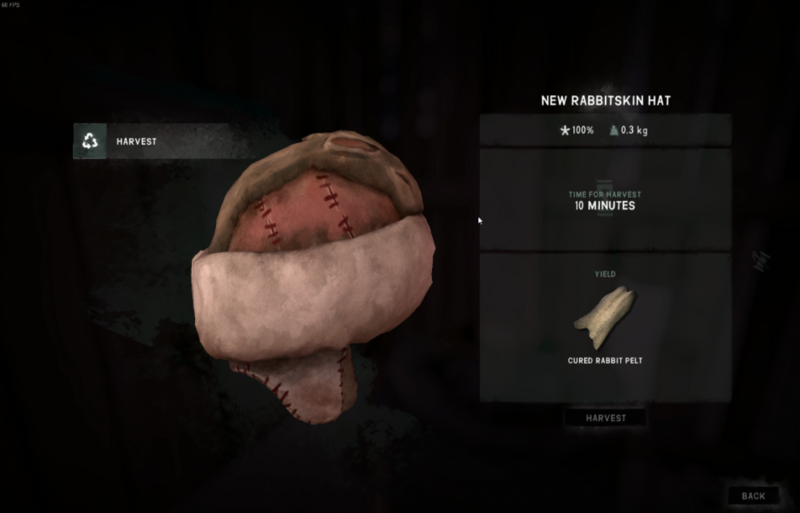 Might get some rabbit meat as well. 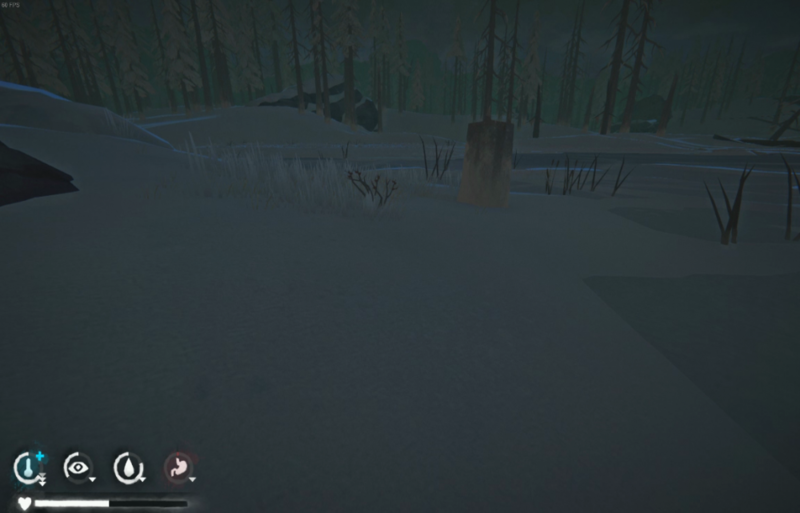 I find all 3 respawned here and I hit 3/3 while also getting condition loss from cold. The fire looks so good when you are out in the cold like this. I harvest, cook and eat to stem the condition loss. I don’t think I want to carry much meat back with me to camp for fear of a furry meat seeking missile. The sun comes up and my day/night cycle is off by several hours. I should be sleeping by now but still have a long way back to Spence’s. Fog is thick and don’t really feel like traveling blind through it but my fatigue is down below 20%. 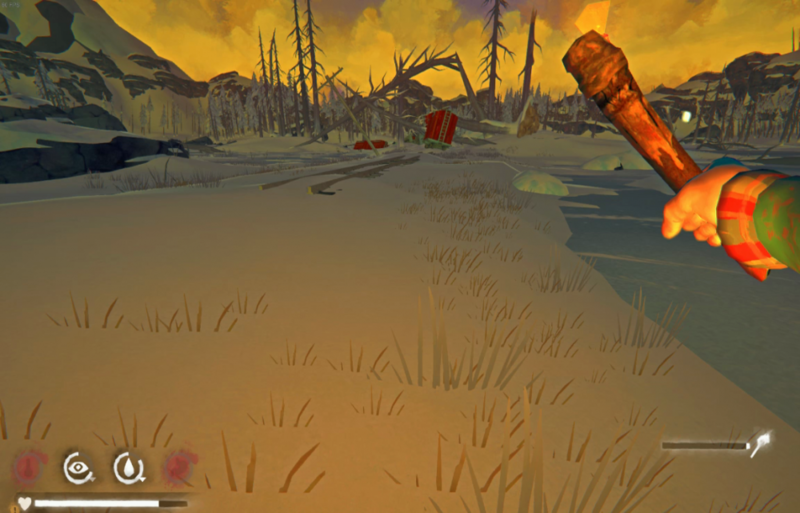 80+ sticks, plus all the hides and guts is a good nights work but I am now fatigued and overburdened and have a long walk back – this is going to hurt. It’s almost a carbon copy of what killed Keg 1. 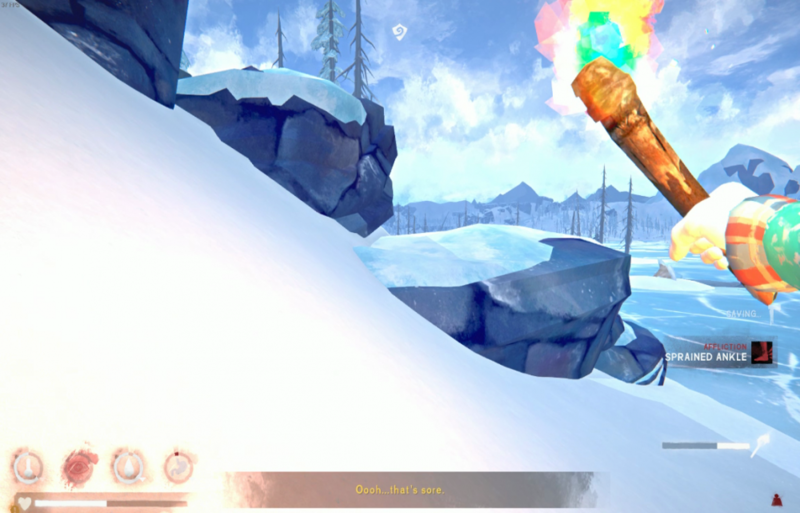 I remember not to push forward in the cold and take my warmup breaks as fatigue will not kill me so fast as the temperature (I have about 40% condition as I leave the fire with 5 torches). The sky is clear and the wolves are howling so there is a good sense of where they are right now. 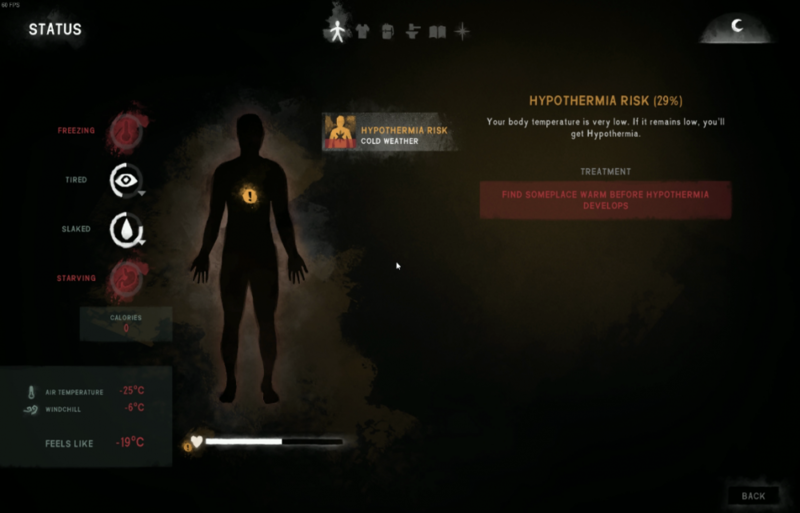 My warming drink allows me to skip the first cave warmup and push forward to the bunkhouse cave which is where I want the guts and hides dropped anyways. No wolf here either and temp still 60%+. Damn, sprained ankle on a slight side hill. Made it back and with a few more treasures picked up along the way making a total of 99 sticks left for my slumber fire. I sleep 4 hours to see if I can make use of some of the night to reset my sleep cycle but I awake to a new day and a blizzard to great me. Awake about 8pm after that short nap. Not going anywhere until this weather clears, may as well take advantage of the cold to finish sleeping. 10 more hours and it is about just before morning. Fully rested and 4 hours 49 min left on the fire, must have been a very cold sleep. FTL of -25C outside the barn, light fog but decent visibility out to collect sticks. I break down branches and find loose sticks on the ground all around the barn. I manage to attract the attention of a fluffy furball on the hill towards the broken tower and I high tail it back to safety. All this sprinting has used half the fatigue so I eat a 0.5kg steak and 5 more hours sleeping, what a lazy day. Weather is nice right now, just -14C FLT. 4 matches still in the pack and 48 min left on the fire, time to make a plan for the day/night. 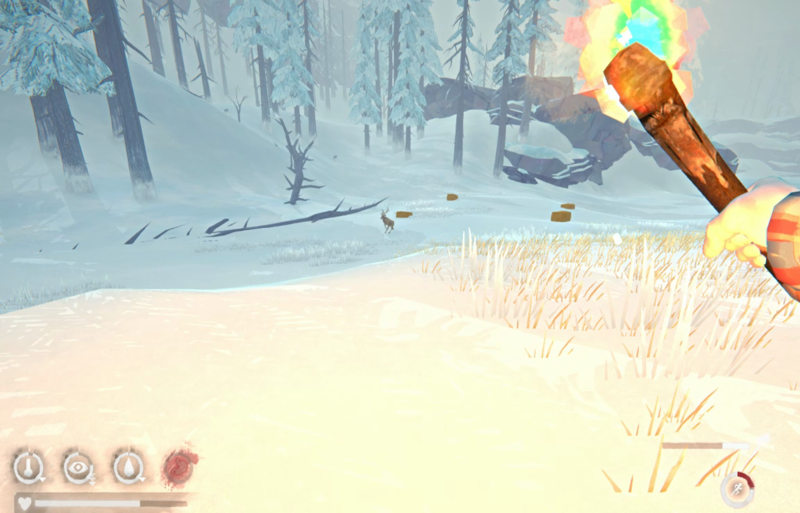 Pull some torches, add a second coal to the pack and 5 more cat tails to make it lucky #13. Off towards low blind and I catch a glimpse of 2 unharvested cat tails, or did they regrow now that I’ve been here so long? I guess there is just so much ground to cover sometimes you find yourself on a new path. 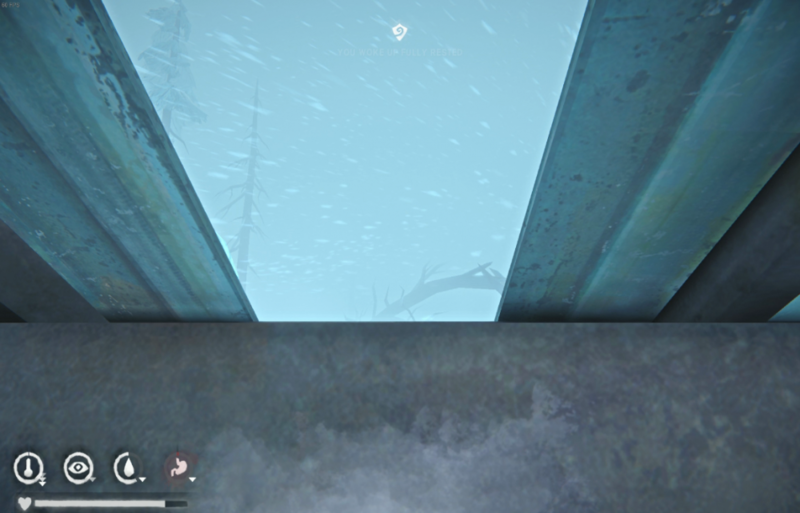 I try my luck at “wolf alley” between the train cars and Marsh Ridge near the zone edge. I creep up a small hill and I think I can hear a gentle crunch of snow so I stop to listen more carefully. One wolf to my right behind a tree, a second wolf to my left is wrapping behind me along my scent trail. Looks like I might be cornered and will have to drop a fire but there is a narrow escape behind me as I drop off a small ledge back towards the blind. 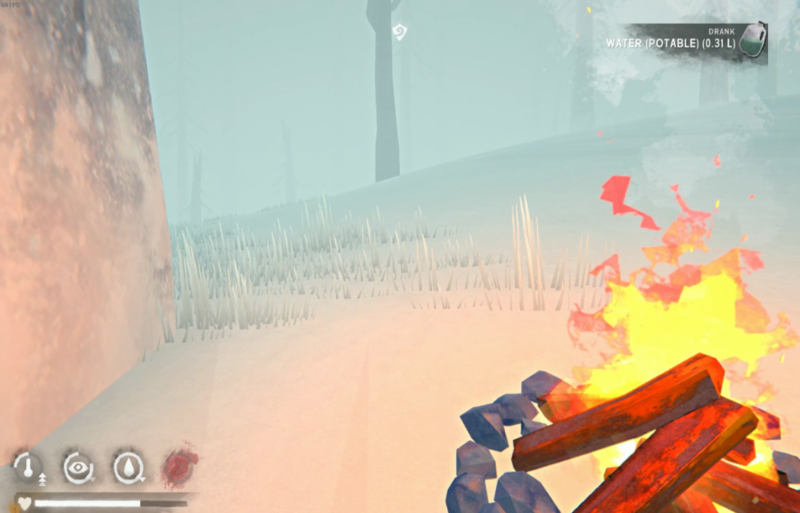 The wolf runs to chase me down so I find a useful fire spot quickly (next to a bush) and light it up. 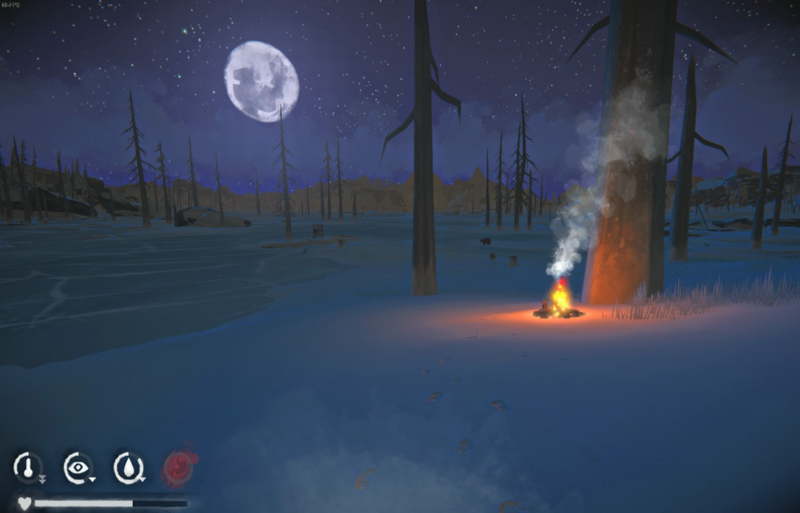 After scaring away the wolf and breaking down the bush I can add a coal and really start to warm myself. The fog is playing on my nerves knowing that 2 wolves are just up and over the hill in front of me. How much do I risk for some measly sticks? I pass time to bring my temp bar all the way up to max. Only 2 down arrows, this equates to about 40min away from the fire without taking condition loss. 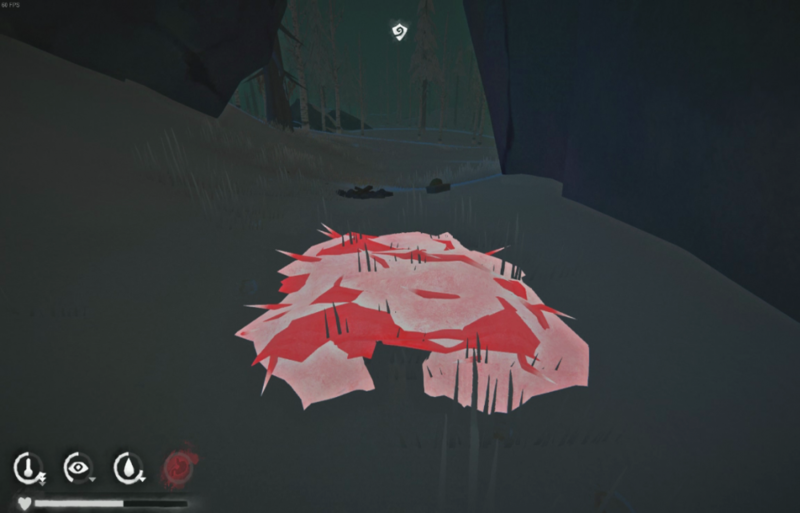 2 bushes or 4 branches are possible. I walk away from the fire and up the hill I catch a glimpse of grey fur. As quickly as I see it though it runs yelping away doing 180 degrees from me. 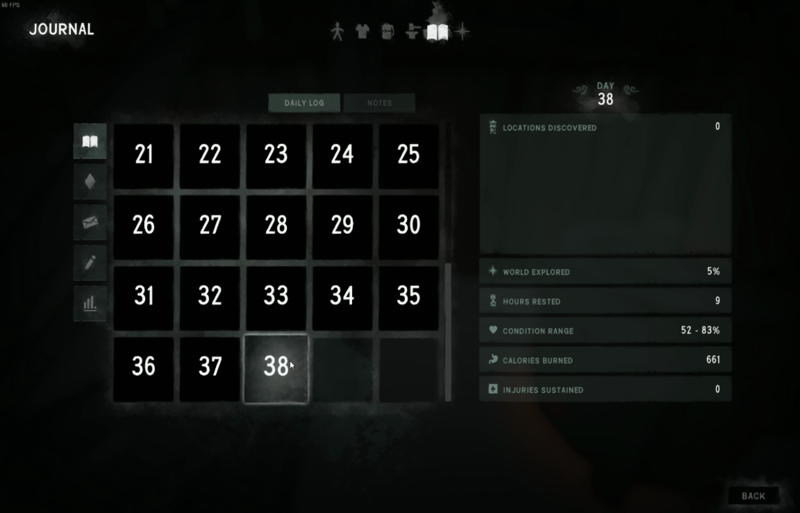 This must be the low chance of wolves being scared away when they see humans even though I do not have the wolf or bear coat to improve these odds. 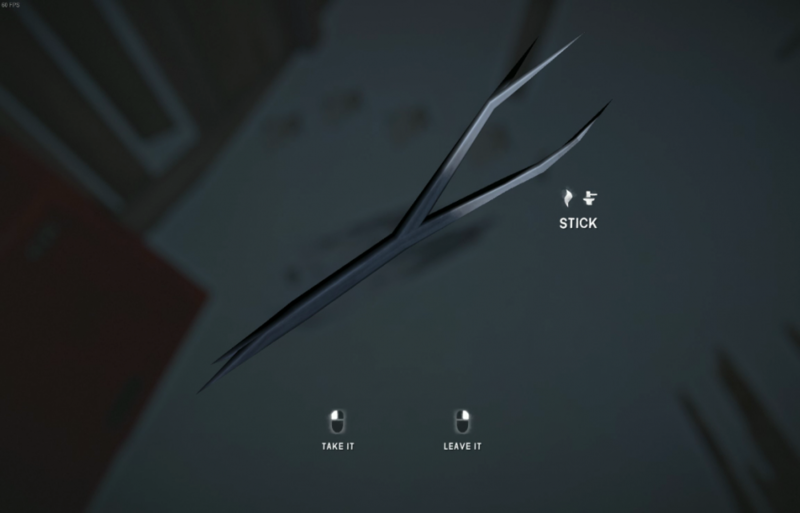 I’m sure glad I did come up here, stick jackpot on the edge of Wolf Alley. I collect all but 3 on this trip as a wolf interrupts me once again. I beeline back to the fire at a sprint with the wet slobbery growls right on my heels. I roll the dice for a trip to get the last of them, lucky too as I find some more reishi as well. This is Wolf Alley, enter at your own risk! Dusk is coming, I am already overloaded with the plethora of sticks today – 130 in total. 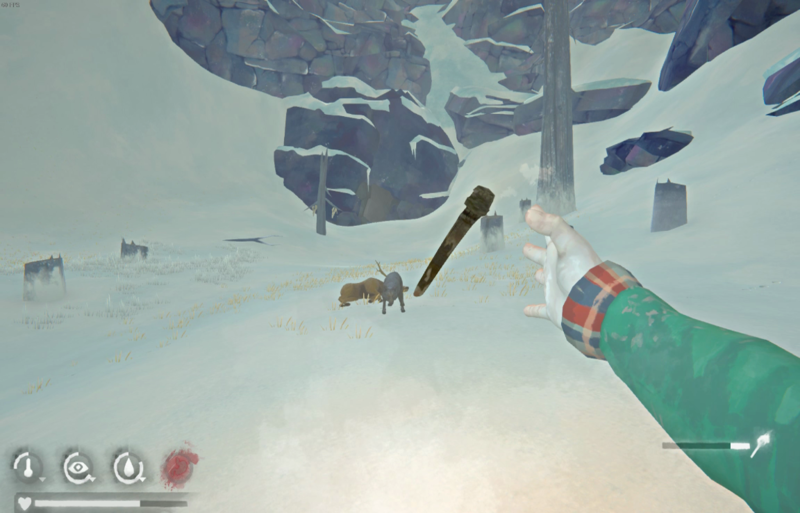 Now as long as mister bear sticks to his ice route I should be able to transfer all this loot back home in peace. 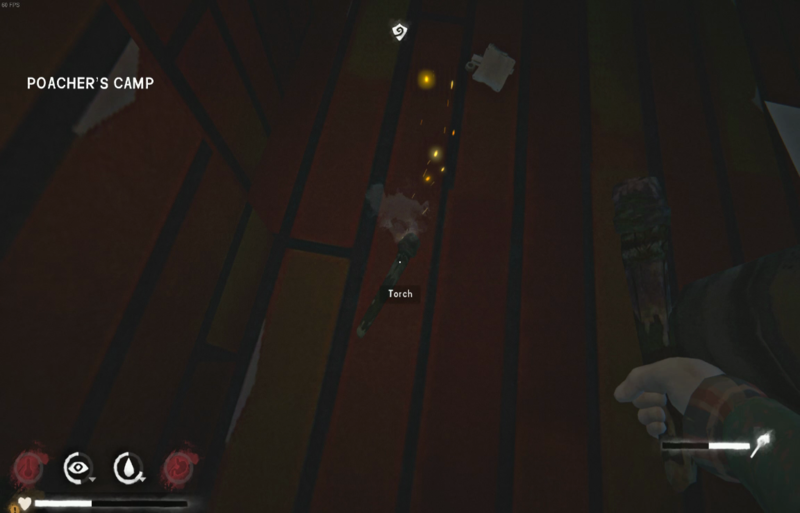 I pull 4 torches and start moving away from the fire. Almost on cue I can hear the blowing wind pick up, is a blizzard coming in the next few minutes? I don’t even make it to the train cars before the torch is out, that will cost me another match. Temp has dropped suddenly to 3 down arrows, no time to check the FLT. Still running along the ice and small sidewall and I hear the terrible snapping sound of my ankle (and my wrist for good measure). 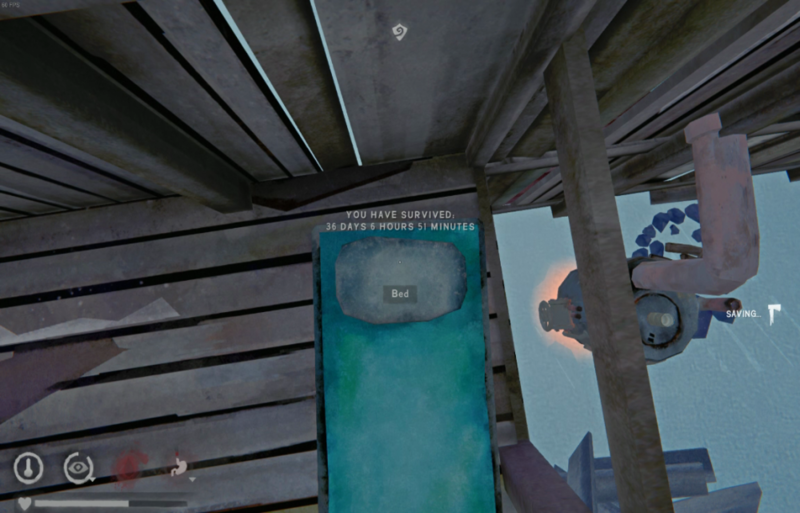 This situation has gone from bad to worse in a hurry; all this fatigue to burn and now no sprinting. Limp back home without seeing any more wildlife. 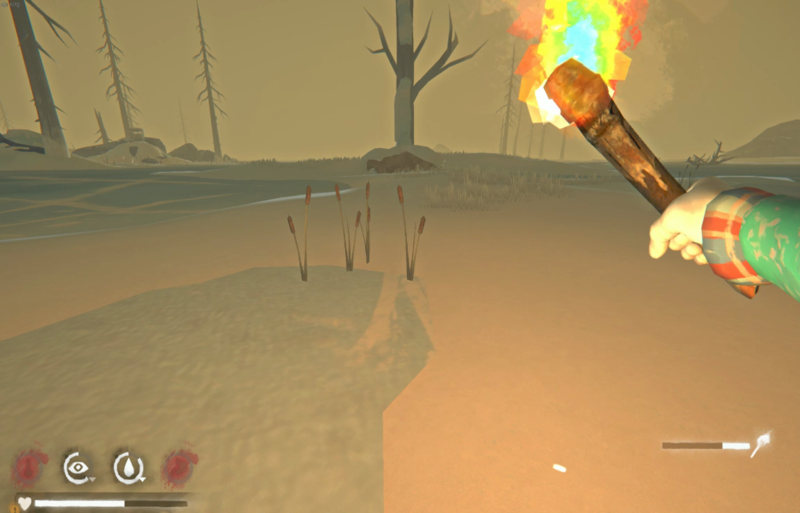 Light a torch for the fire start, 3 matches and 1 flare remain. Time to heal up from this 55% condition, and 20% hypo risk, although that was not too bad for the trip back in that storm. Impressive, I wonder when you'll hit the last two firestarting levels and get that bigger duration bonus. That could be a game changer in regards to keeping you a net positive in firewood reserves. I must confess I'm surprised by the wind behaviour in FM in this run, I wonder if they changed it but before HRV came out FM was the windiest and most miserable place to torch travel. 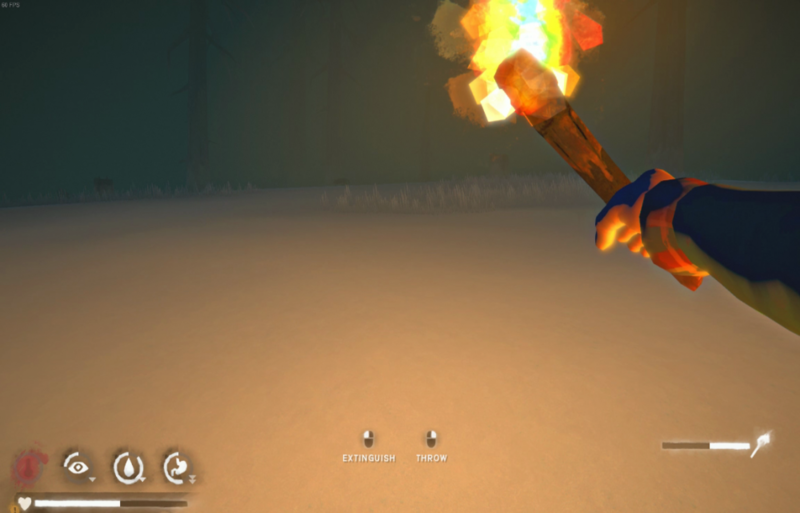 I couldn't keep a torch lit unless i travelled in heavy fog. It's possible, weather in other regions received a shake-up as well a few months ago. Most impressive run. 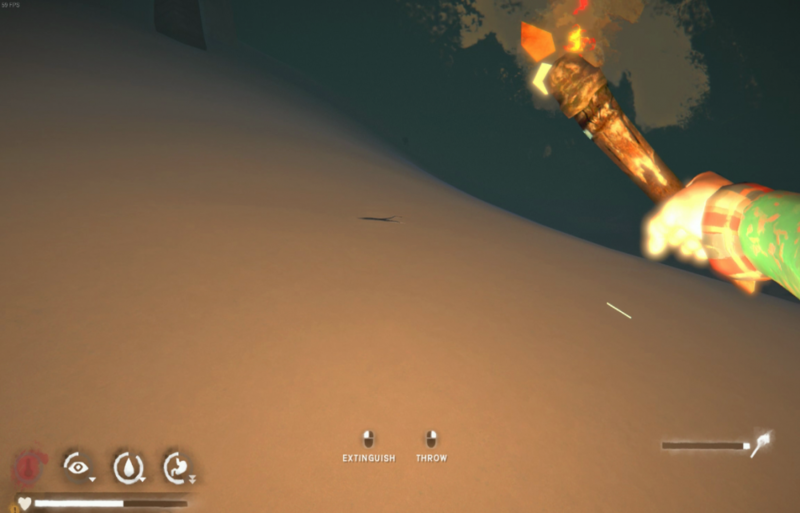 Gooner77, the one who carries fire. That makes sense, I stayed 20 days in Coastal Highway to constant blizzards and the occasional nice day peppered in, then I moved to DP and the weather was surprisingly nice most of the time. This day begins after my painful walk back on a broken/sprained ankle. 1 match used means 3 will be left. I am loaded with more than a nights worth of sticks. I sleep for 4 hours to heal all the sprains. My day/night cycle is being pushed around and it’s the earlier consistency that has extended this run as far as it has gone so far, I need to get back to sleeping during the cold morning hours. I have 75% fatigue and it’s about 2am so time to get to work. 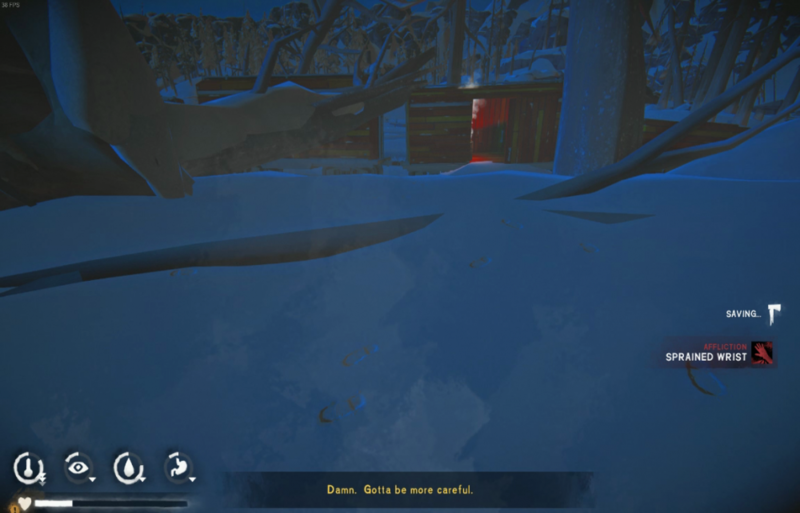 6 hours 40 min left on the forge and it is blowing and cold with wolves down by the boathouses. I’ll try to go the opposite direction to the hill above for safer stick collecting. 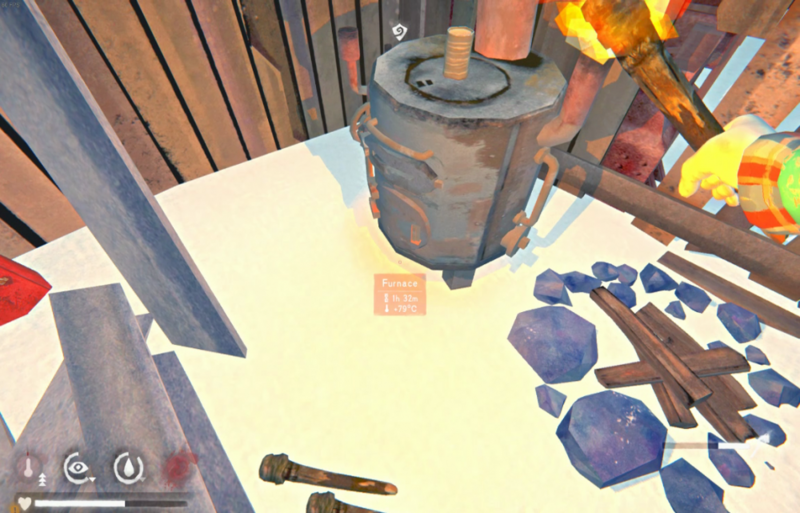 Break down 6 ruined torches by the fire to warm up. One of my cans now is 0% and ruined as well. 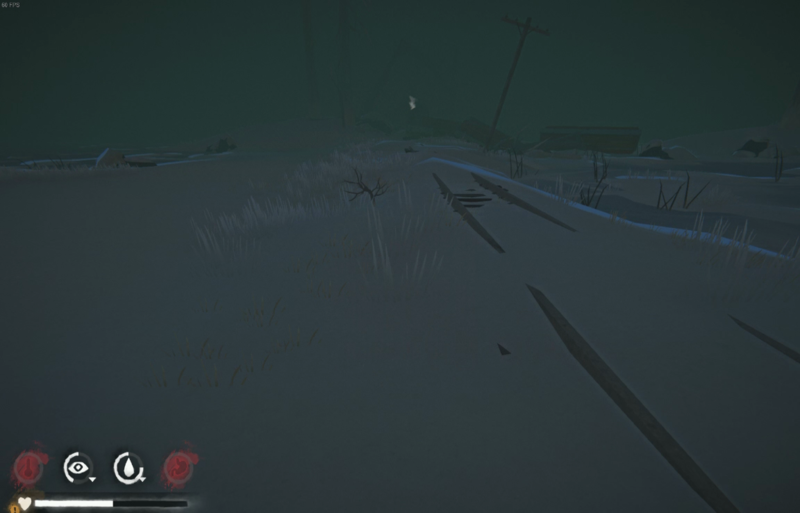 I am sprinting around like a madman to get all the way out to bushes to break down and get back with minimal loss of health. Bushes are my lifeline out here as they are net fire positive generally. 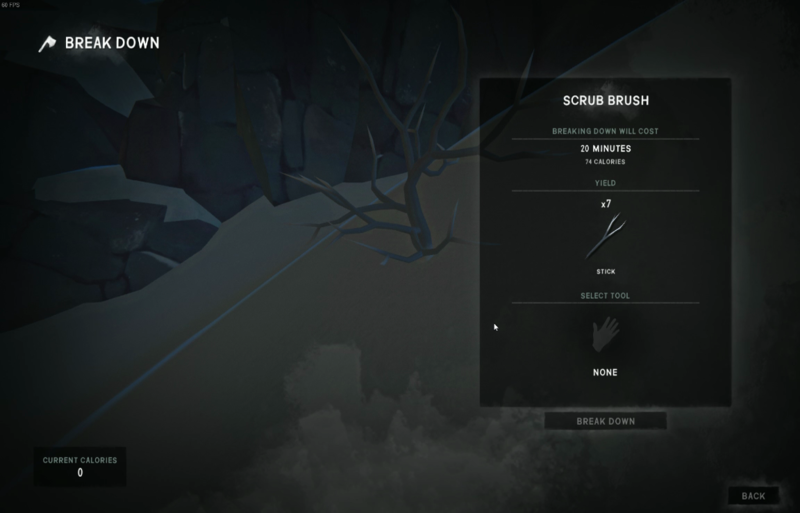 The best part is you can sprint all the way to the bush and then after the 20min breaking down you can sprint all the way back to the fire. 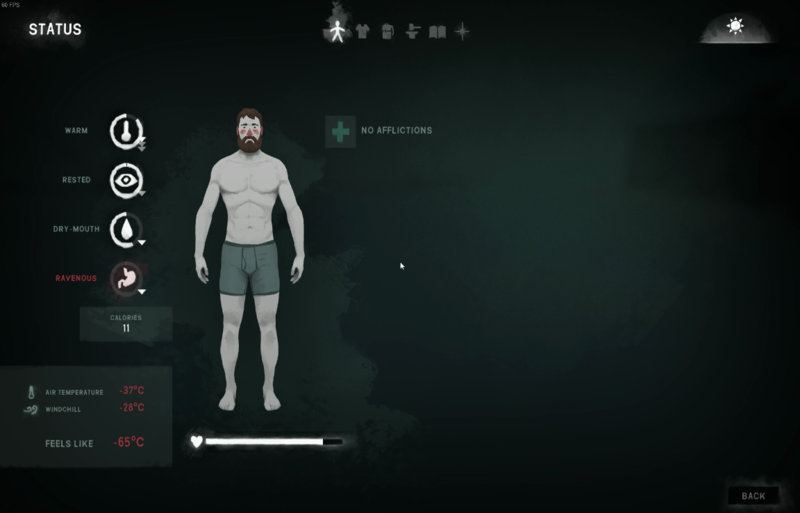 I’ve managed after a few sprint runs to wear myself down to 20% stamina and can now sleep for nearly 10 hours. A 0.5kg steak and a cat tail for dinner or is this breakfast? And off to bed. Condition back up to around 70%. IRL been super busy this last week, sorry for not posting. Back at the adventure recollection and been able to do some video watching and story writing - enjoy. Wake up is in the late afternoon. Trip to Marsh Ridge is quiet and uneventful and I make it all the way to the mountain goat climb before my warmup drink expires. 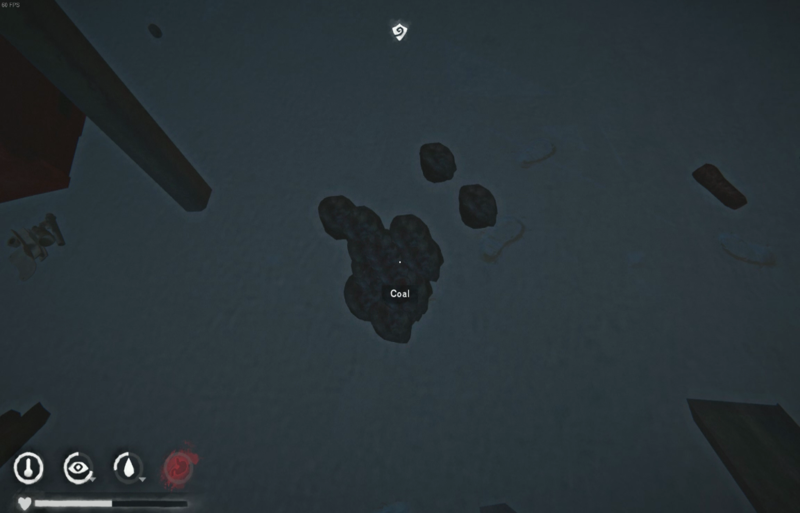 I am hungry and could use a rabbit as they have respawned up here but I forgot to load a rock into my inventory. 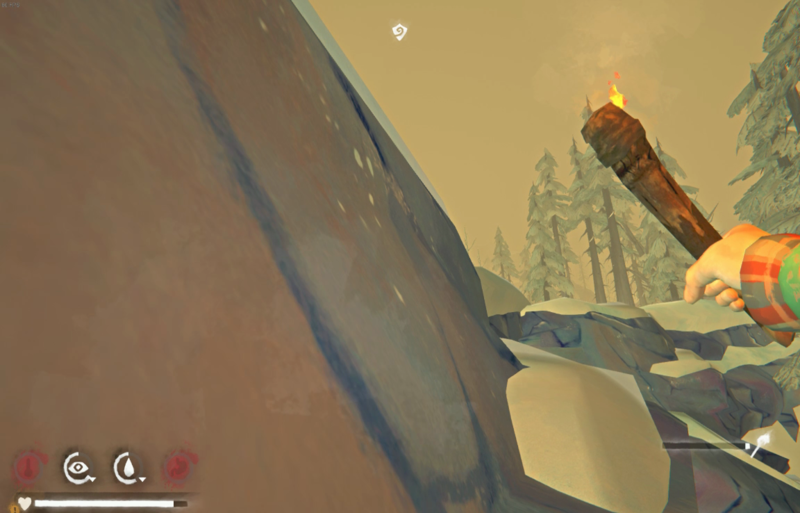 Oh well, I will find some in the cave after I transfer this torch to a fire. I’ve got my lantern and good supply of water here from prior trips. 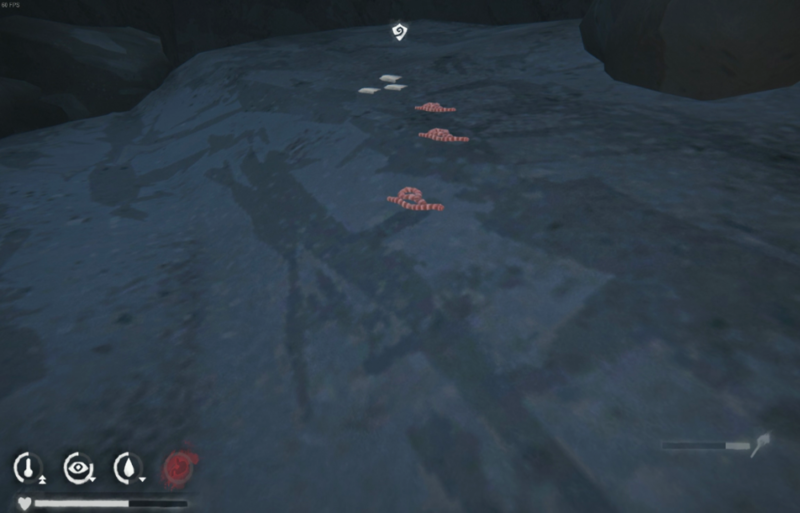 I search the entire cave and find 11 sticks and 2 coals have dropped in to the game for me to use. I warm up by a fire and take 2 stones for a rabbit hunt. I miss my first throw, been some time since that happened. The second kill though we got another backflipper. Back to the cave fire to warmup and harvest some meat. Warmed up enough to go back out for the third and final rabbit. I collect sticks on the return to the cave. 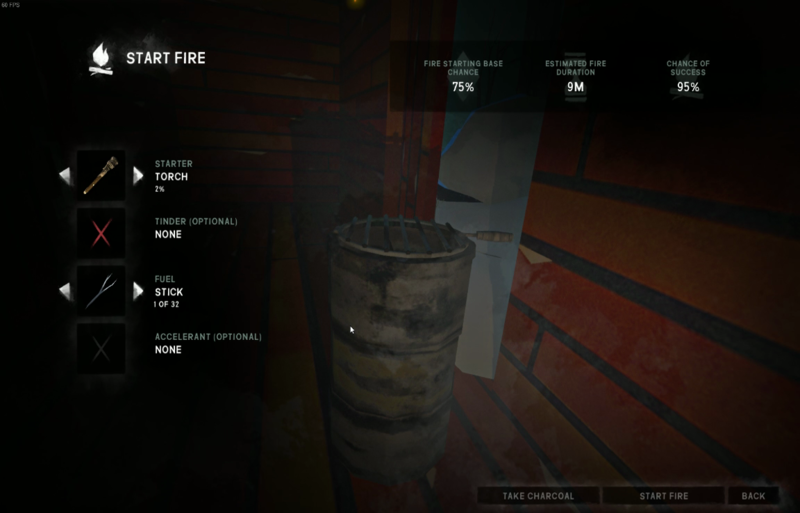 Campfire has glitched into the floor and I now only have 1 cooking spot instead of 2. 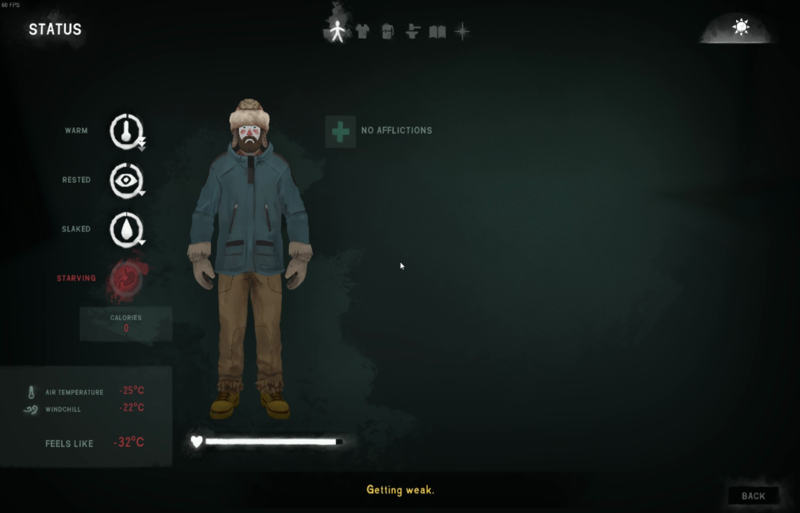 Harvest a bunch of meat and break down bushes when I am warm. After the meat is taken I contemplate what to do with the 3 carcasses. Do I take any of the guts and hides or is this the point of diminishing returns where I can no longer see much point it prepping supplies for curing and future clothing fabrication? I eat all the meat for 70% on the food meter as I don’t want to smell on the trip home. Fog has come in pretty thick by now but I know the way almost from tree to tree in this soup. For me navigating in the fog is also about the elevation and the contours of the land that help more than anything. I remember when I have to go up and down a hill or into a small valley as these are some good points of reference to stay oriented. 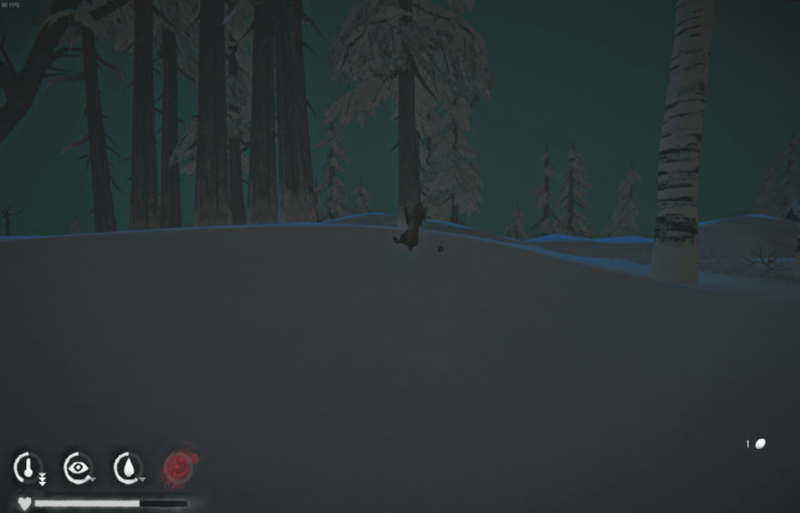 I sprint a bit and manage to agro a wolf that I can’t see down by the ice. He’s out there somewhere in this vile mist. Do you see him in this pic? I remember that I kept one carcass so I drop it as bait and make out quickly towards the train cars. 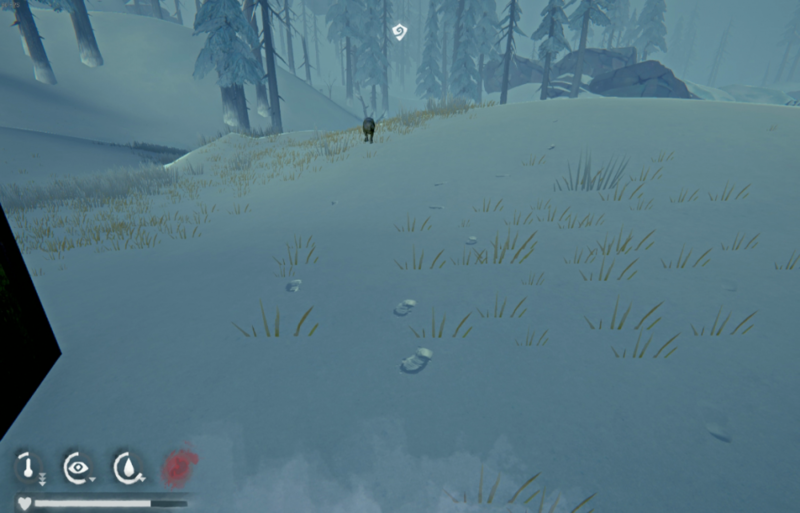 Somehow the wolf path after eating the bait is not in the opposite direction as I had hoped but she is actually paralleling me near the top of the ridge. How long will she go before she gets hungry again and decides to track me down for another meal? I don’t see another living thing on the rest of the trek but I do hear breathing off to my right at bear island, don’t stop to check it out, just keep moving as I have 35% hypo risk. 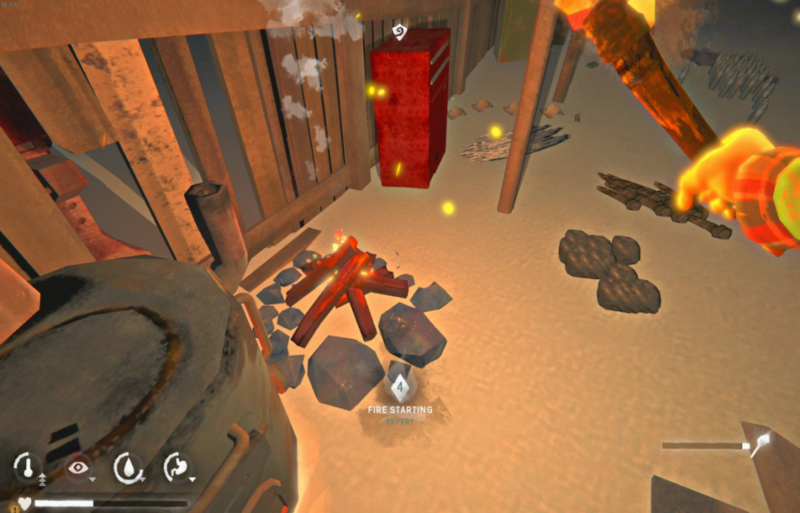 I start an extra fire as I warm up and grab level 4 fire starting bonus – that will certainly help in the long run to minimize fuel usage. I have a few extra torches but I don’t want to break them all down as it is not every fire that you get 47%ers. I still have enough calories in store for 10 hours so I drink up to full satiation and sleep. How does it happen that they lose condition (except letting them boil dry)? I have never really paid much attention to when the condition goes down. I'll watch for boiling dry or if it's just how many liters made. It's just when the contents boil dry, I believe is 10% condition lost when it happens. Had that happen to me recently, some of my cans are looking a bit rough. Day 34, I think it's fair to say you are the Forlorn's legitimate emperor, hats off my friend. Start today at 71% condition, 43 cat tails in stash and of note my pants are now 8%, not much use there now. 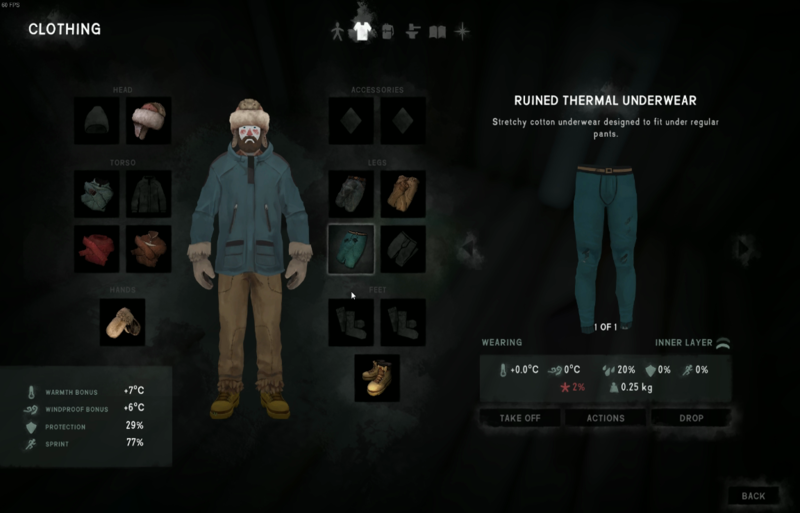 2% on my thermal underwear is giving me a whopping +0.0C bonus. No more socks, they are long gone. Boots at 50%, outer sweater at 19% = +0.1C and thin wool sweater at 47% for +0.5C. 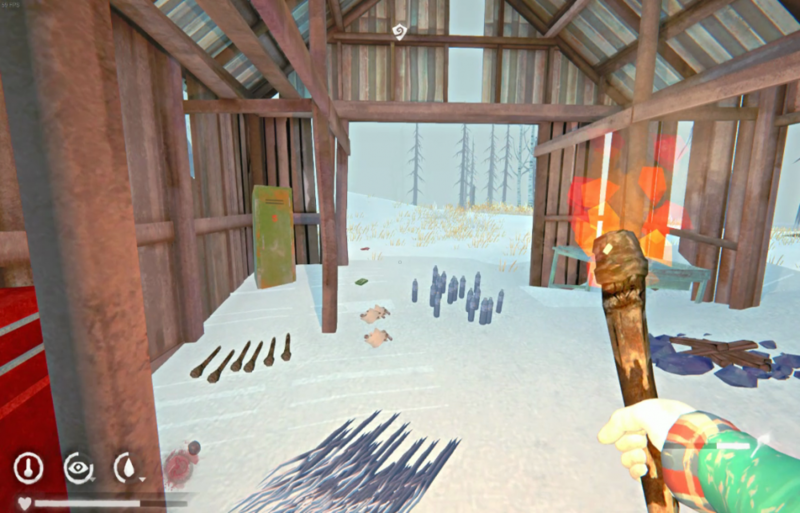 FLT is -13C with only 2 down arrows so I move up the hill above the barn and collect fallen sticks. 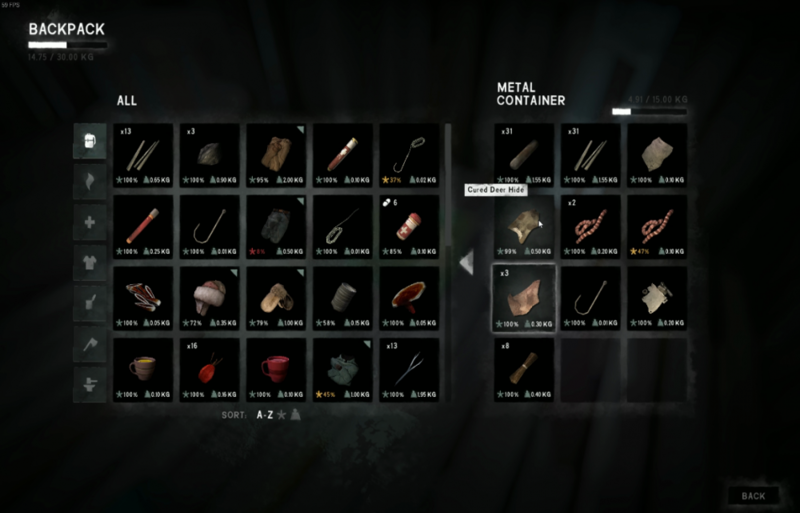 Pretty good haul today in a short trip, wolf doesn’t let me get closer to the tower cave area. 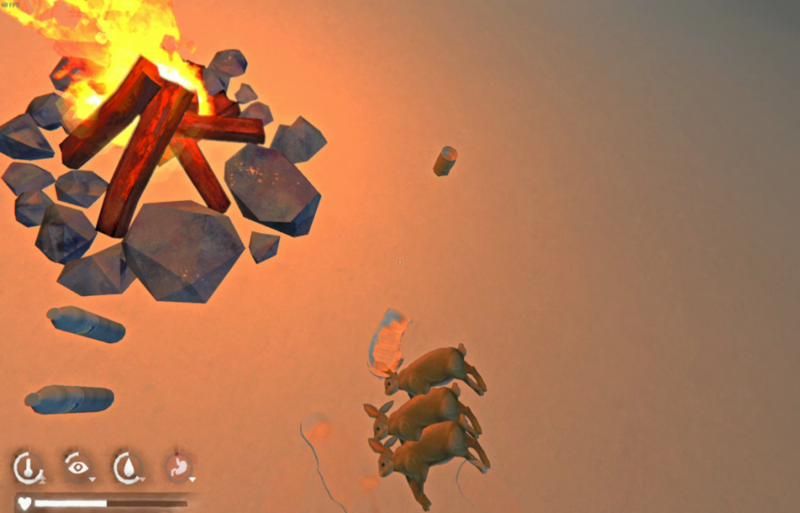 I warm up by the fire harvesting my thermal underwear. 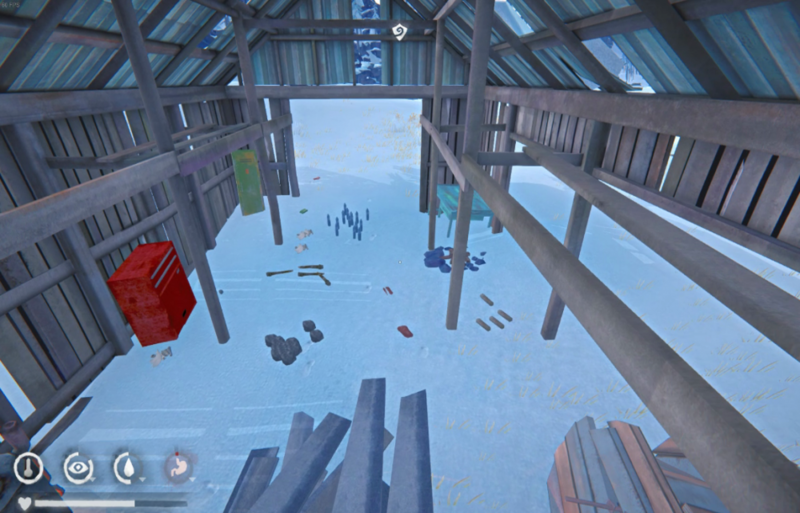 I break down 2 shrubs in good weather underneath the dock towards bunkhouses. 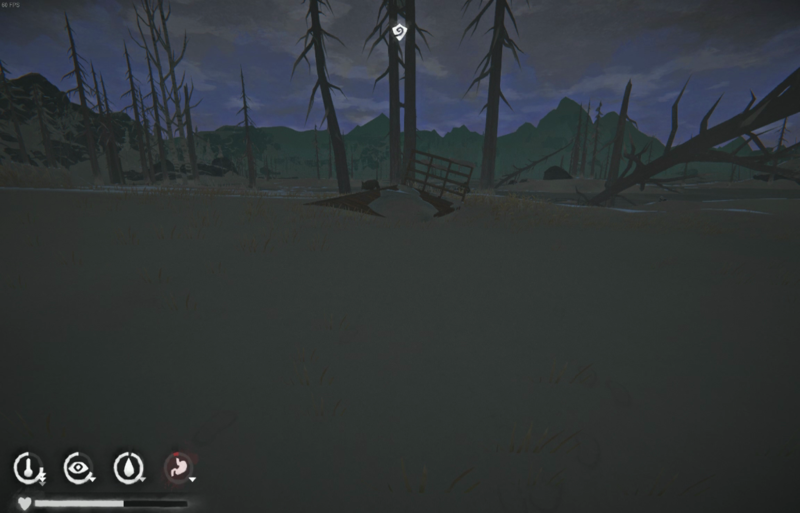 My heart skips as I hear a wolf walking during the 20min, good thing I am crouched. 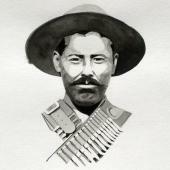 Back to the fire to warm up then out for another cold trip past the bunkhouses for loose sticks and burned out torches. Time to try a less traveled route tonight, past the high blind and along an island path. I find 4 still unharvested cat tails as my temp drops to nil, have I never been here before? 11 more cat tails makes 15 total and 5 rose hip bushes untouched, what a haul. 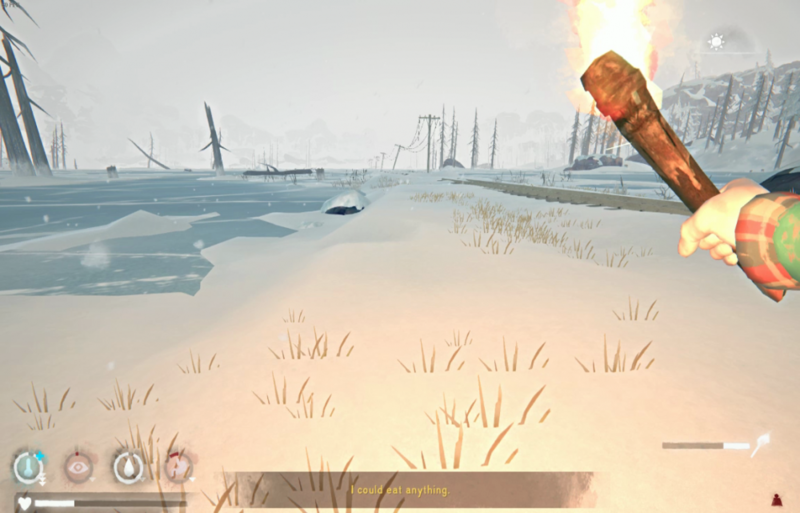 I’m in sight of poaches and my torch is almost out as I look at starting the fire, if it fails I will lose a match but if I try to drop it and light another maybe I will be too late. 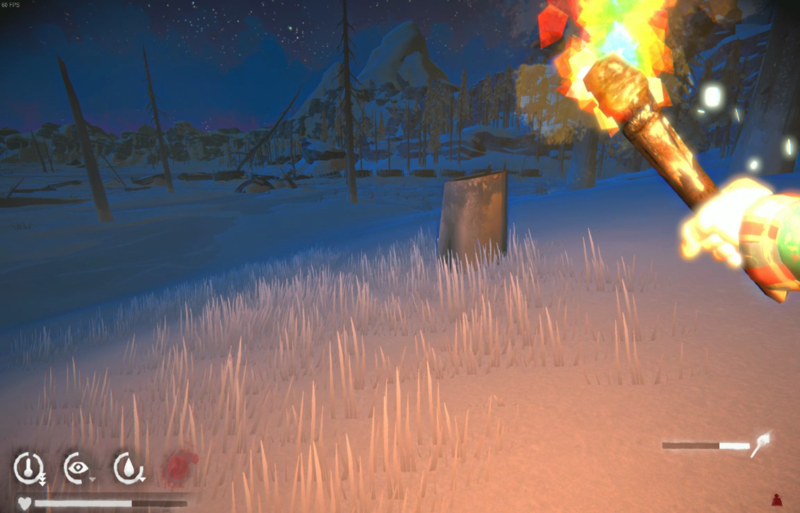 I decide for the relight and just catch it in time – should not have cut that one so close as I had lots of torches. Rose hip tea to warm on the fire, craft some more for later and add a coal to really warm from this hypo risk. Down to almost 40% condition. 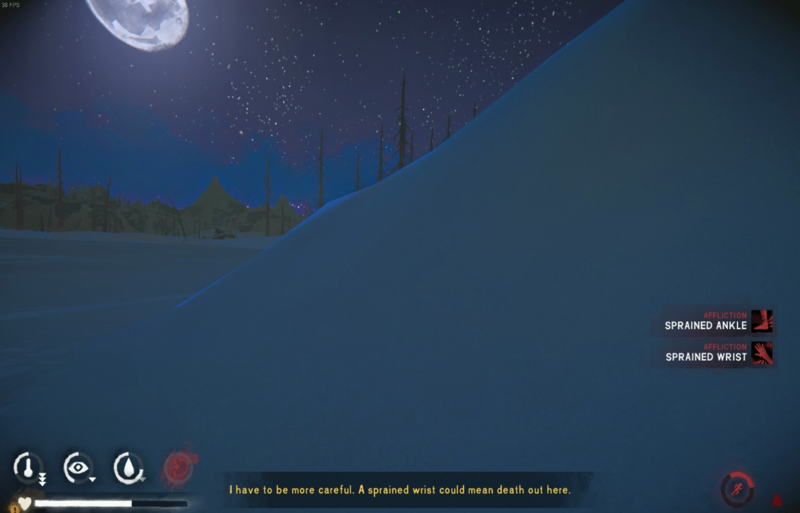 It is now a beautiful starry night in the muskeg. So clear you can see almost every corner of the region. Wind has come up now so I test a torch to see if it staying lit. Surprisingly it does even though by my experience this must be right on the borderline of getting snuffed out. I also test the FLT at -38C and while walking on level ground in front of the box car just past the fallen logs on the hill I sprain a wrist, this is rage inducing. I top up the fire to contemplate my next move. Rush for home or wait out the night and wind and get completely exhausted? I eat and drink so I don’t lose any more condition then pass 4 hours checking each hour for the wind to subside. Finally, the sun is up and it looks passable for travel. I warm a reishi tea and set out with exhaustion almost on me. 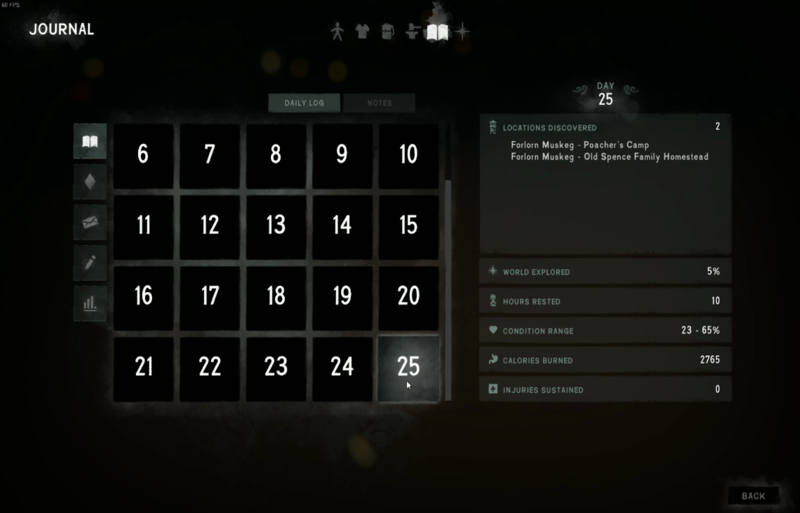 Technically this is probably day 36 but we’ll let it run until I get some sleep. Make it back cold, tired and hungry but always a welcoming site that forge and barn. I sleep for an hour to cure hypo risk then throw one coal on the fire and eat cat tails and drink up to max and set to bed for 10 more hours. Absolutely - I should see a doctor about that unhinged jaw. Of course with all the extra time sitting at poachers in the wind it is well into night when I wake up. I don’t think I am back to 50% condition, more like low 40%s. 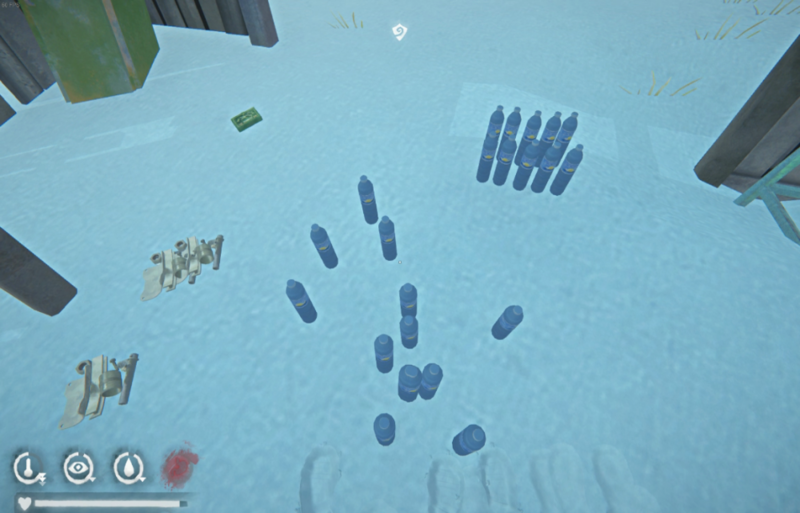 Checking up on my fuel supply, I have 151 sticks on the ground, 14 coal and 2 more matches to go deep. Another rush trip up towards the tower behind the barn. A good haul of sticks there tonight along with 1 branch broken down per trip. 2 branches broken down gives me small hypo risk and a little more condition loss. 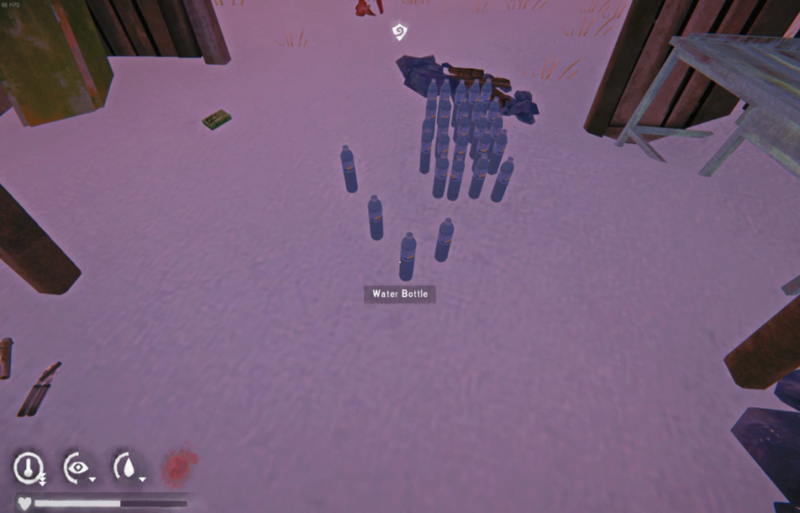 A few more runs thru the night and I have built my stockpile to 186 sticks all with 20min or shorter runs from the fire. 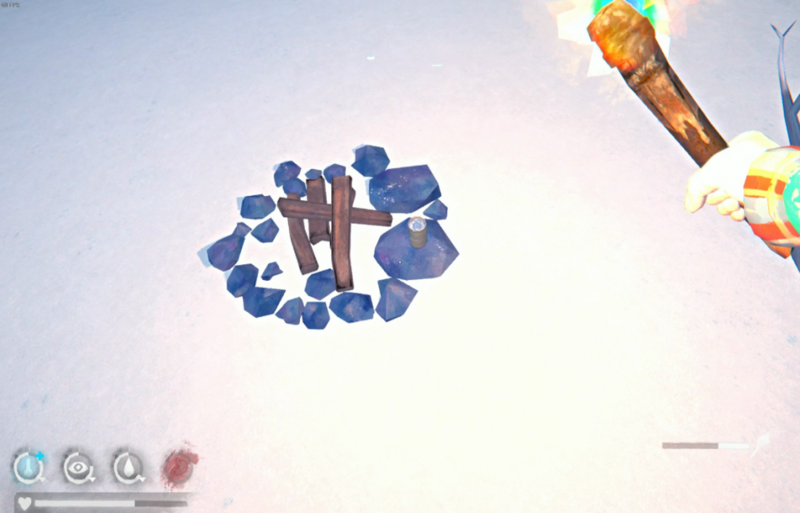 I add 34 sticks to the fire and get ~9 hours of time to sleep. I pick up my last 0.5kg deer steak and other than that I have just 40+ cat tails for nourishment. 10hours of sleep time logged and done - You have survived 36 days 6 hours 51 minutes. Above 60% this morning and time has passed enough to go pick up some cured guts and hides at the bunkhouse cave. FLT is -14C so I make it all the way there with half temp meter use. 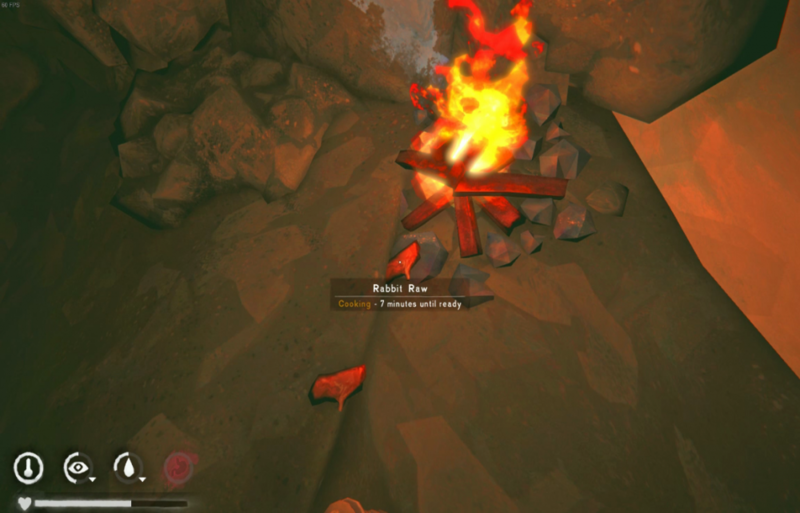 I start a quick fire anyways to warm up slightly using the inside/outside cave fire set before. 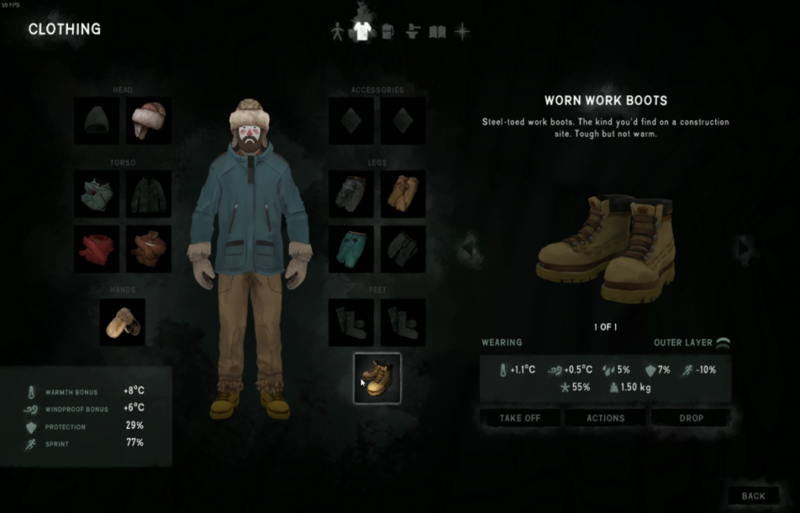 The hides will be used to fix my current gear back to 100% for the next phase of my survival here in FM. With just 4 or 5 sticks on the fire the back cave FLT is +13C. Collecting a few more sticks I hear the sound no interloper wants and it is a storm gusting in. 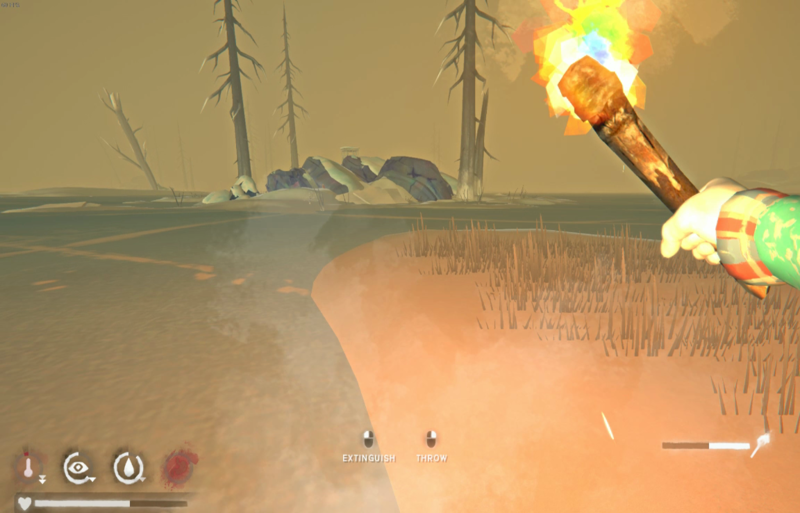 I wonder if this torch will hold to get back to the barn or even back to cave at this point. 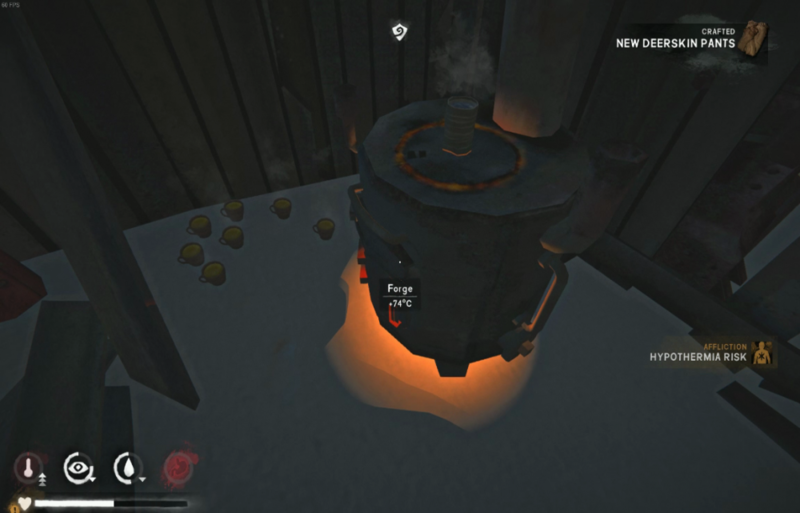 Did I have enough time left on the fire back at the forge to just charge back and hope for the best? I take off in a sprint as the temperature drop is remarkable. I made it all the way here with half temp loss and I’m already at hypo risk before the bunkhouses. I decide to toss a lit 47% torch in a protected spot behind some rocks and light another torch to take me back to Spence’s. This way if it blows out on the last leg I will retreat to the wind protected area and light a fire if needed. 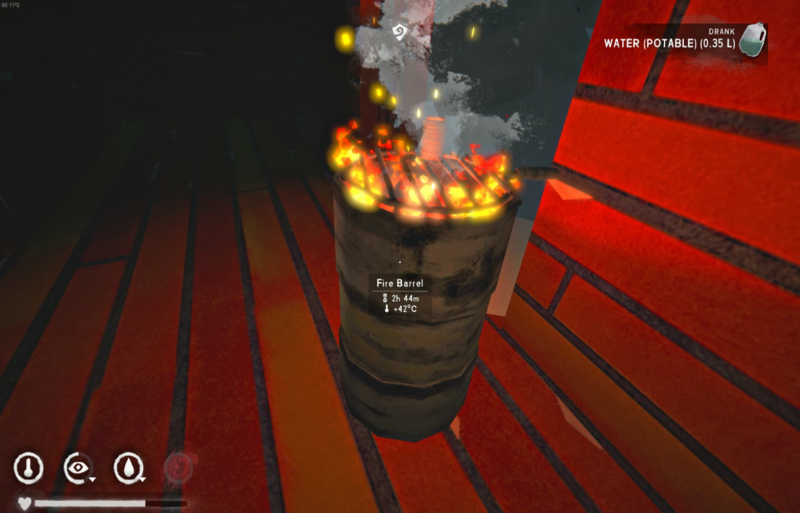 I make it back and still 1hour 32min on the fire, what was I so worried about? I add a bit to the fire, eat a few cat tails and pull out my tackle for a bit of a repair session. 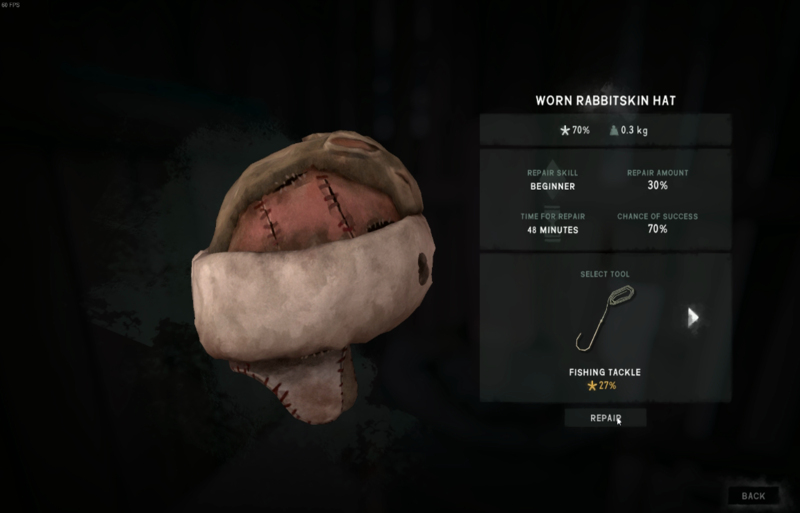 Success twice in a row, both the rabbit hat and mitts are back to 100% and the tackle down to 17%. I made a spare tackle though but I likely won’t need it unless I scrounge together enough hides for another pair of pants. 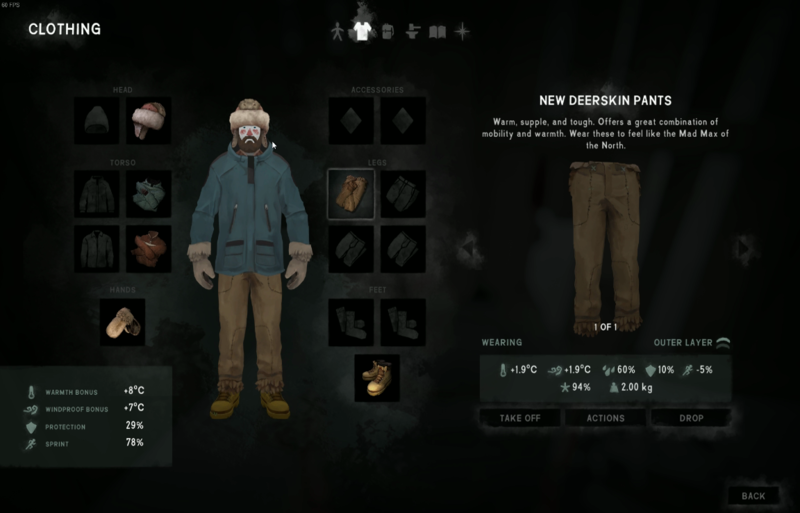 Two deer skin pants would be every Keg Stand dream kit. 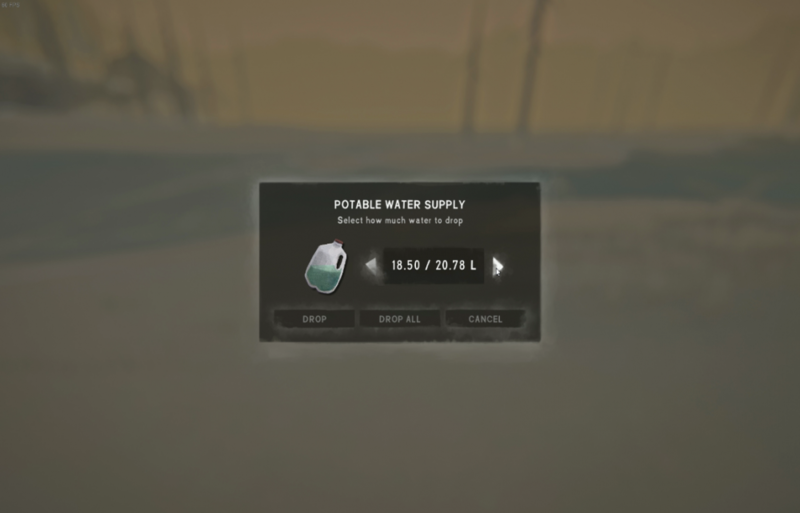 Here is my water hoarding problem – but now it is time to move some of these supplies to another base. Things have been getting a little thin here at the barn food wise so I’ve decided to make a transition to Marsh Ridge. Tonight I will shuttle a bunch of water as far in that direction as I can. I drop all but the essentials from my pack in the storage box and away we go past bear island. It’s not too far away but it’s a start. 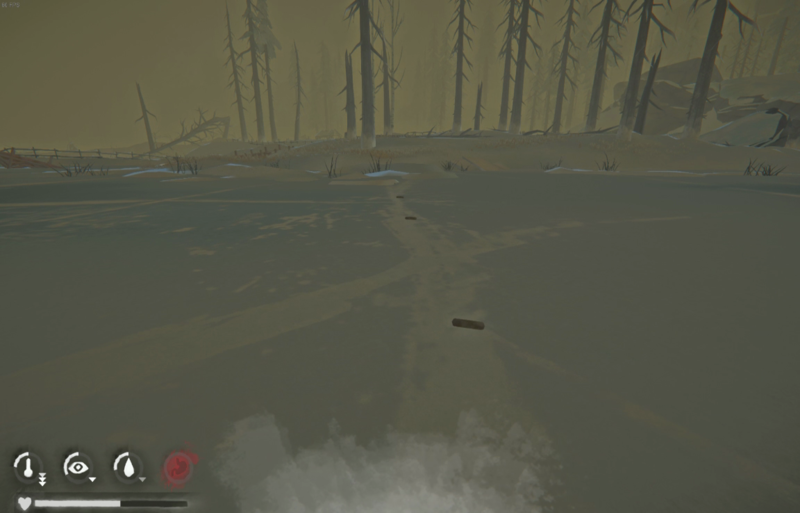 I’ve included a pic of my safe connection to bear island from Spence’s where I have laid down some cat tail heads to mark the strong ice. I can use the crack as reference but it makes me feel better with the marks there so I am 100% sure. I make a couple more trips for sticks and then eat 5 cat tails to fill my belly (47 left). Of to bed for 10 winks. Today is the day I’ve decided to make a move up to Marsh Ridge. I have used up nearly all the bushes within a sprint of the barn at Spence’s and need a change of scenery. 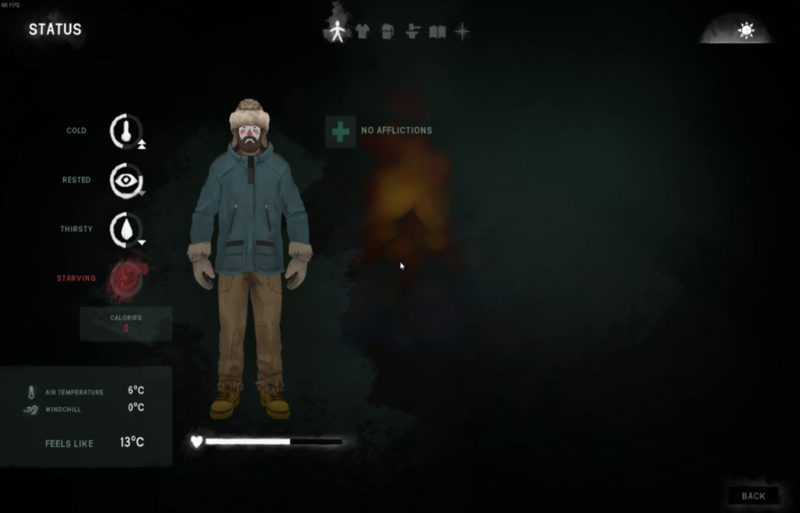 I have 4 cloth ready to go so I can tear up my last sweater and make a shelter and possibly sleep without fire during the warmer parts of the day. Weather didn’t look too good this morning, 4 hours left on the fire. I sleep for a couple more hours to get make stamina. Wake up and it is a full on blizzard. Won’t be leaving until this ends. Full exposure without any clothes gives FLT of -65C. I pass another hour and wind has died down, with clothes now it is -13C FLT. I heat my second to last rosehip tea and drink it for the warmth bonus. Last torch from the fire and I leave this place to possible never come back. 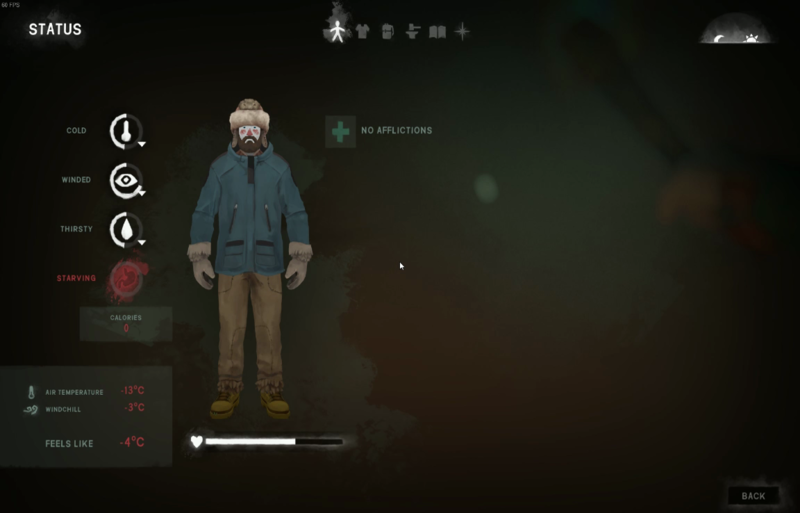 I am freezing before I make it to the low blind. Hypo risk is over 50% by the time I make it to the cave. I pass time by a fire started in the cave. My last cloth needed to make the 5 I scrounge from my only sweater. 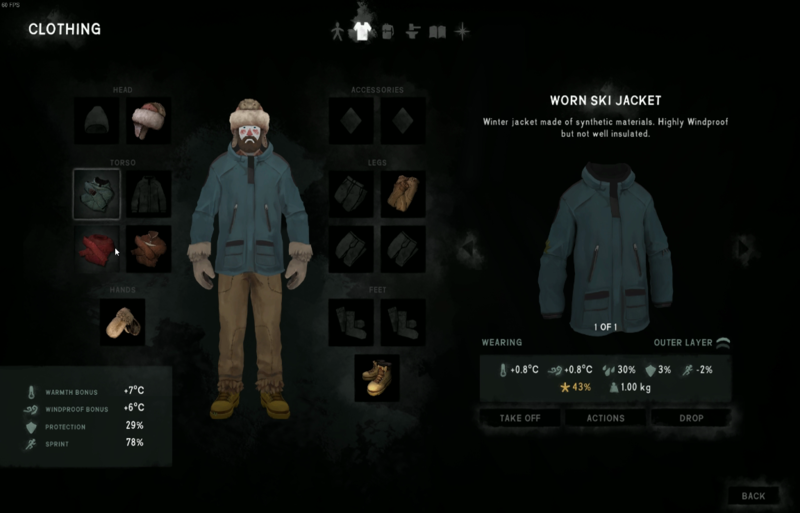 That’s it now, only crafted clothes, my 40%ish ski jacket and boots. 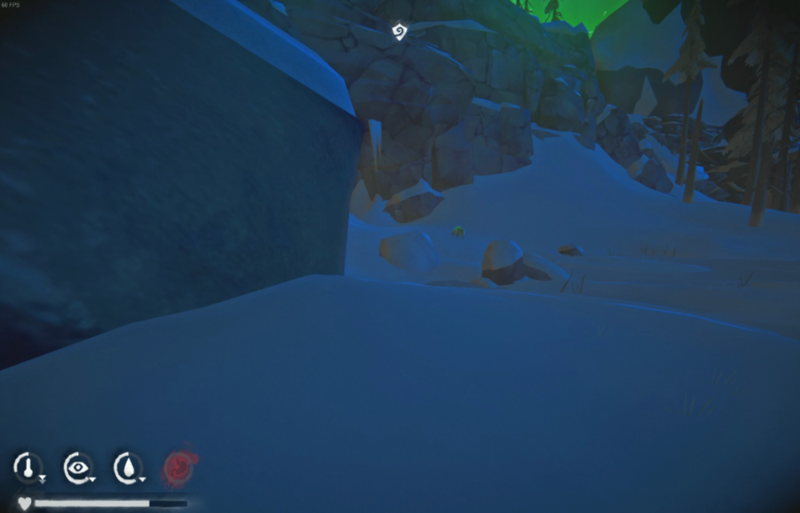 It’s hard to find a spot for the snow shelter in the semi-protected cave. There is not much for flat ground. 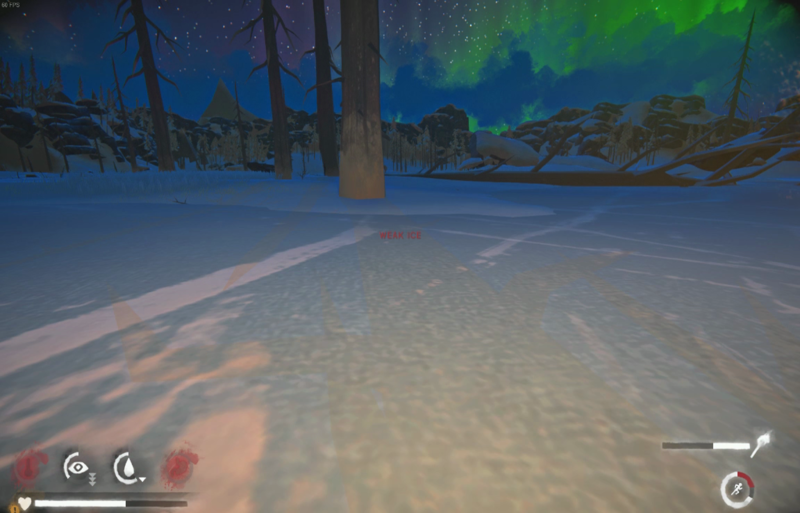 After building I test it out, air temp is -12C inside and I feel like -5C with bed bonus it would be -2C. Not exactly what I had hoped for as far as temp goes, I guess will have to run a fire during sleep hours here too. 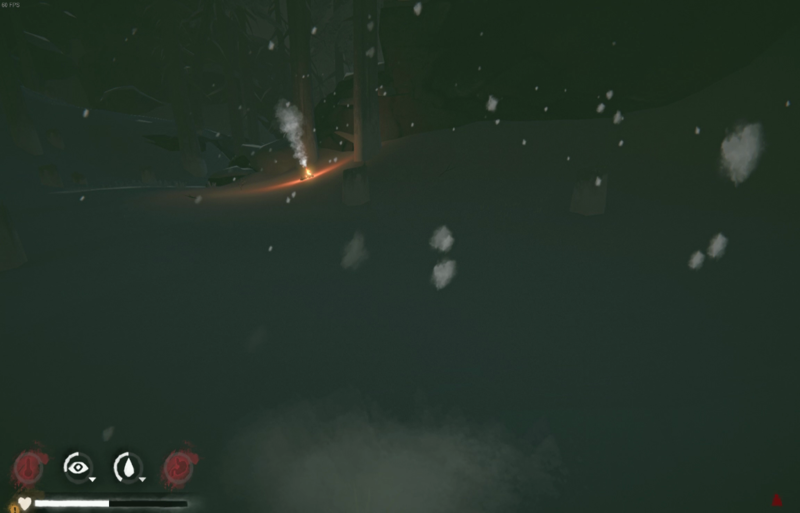 I run back to the cave and stoke the fire up for 3 hours and grab the lantern for a run through the cave, hope we find some coal. Nothing was found so I’ll have to make a go of the fire with my current supplies. I warm up by the fire and then grab my fuel and head to the shelter. 5 cat tails and water with the fire burning and head to bed for 10 hours. I make it all the way to morning without the fire burning out.